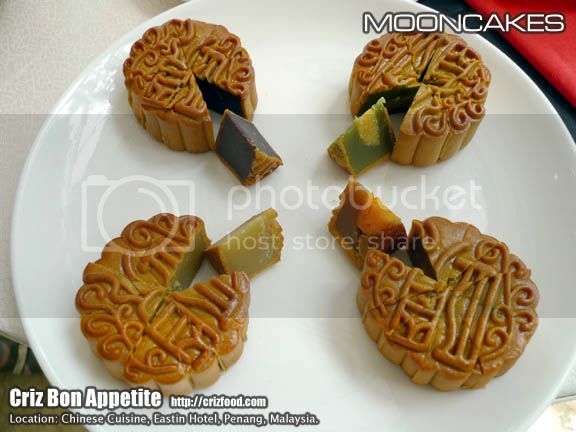 Note: The Pre-order stock at RM38/box for CNY2014 have been sold out. There are only a few boxes left for walk in customers at RM45/box. First come first serve only. 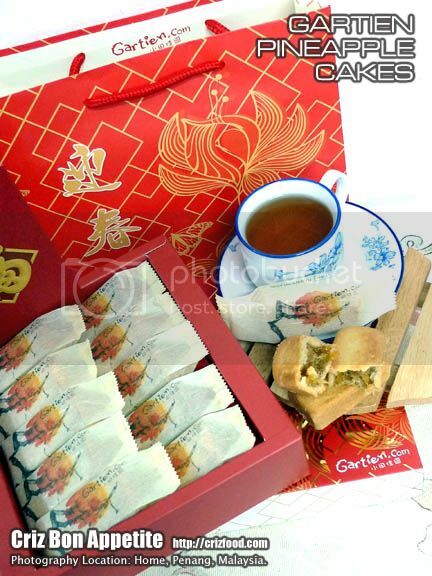 As Chinese New Year 2014 is just around the corner in late January 2014, many families are beginning to jot down their annual customary list of what gifts to present to their relatives and friends. Why not consider Pineapple Cakes? Pineapples carry a deep meaning in the Penang Hokkien dialect – “Ong Lai”, meaning “Prosperity Comes”, a great omen to start a new year. This year, Gartien (小田佳園), a local pineapple cakes manufacturer, located within a heritage house along Lorong Macalister, Penang, took bold steps in coming out with totally new packaging designs. The box is now bigger and dawns in elegant bright red color with gold stampings, while the little pineapple cake packages have Chinese ink printing of Peony (Mudan/牡丹) flowers, the theme set for Chinese New Year 2014. 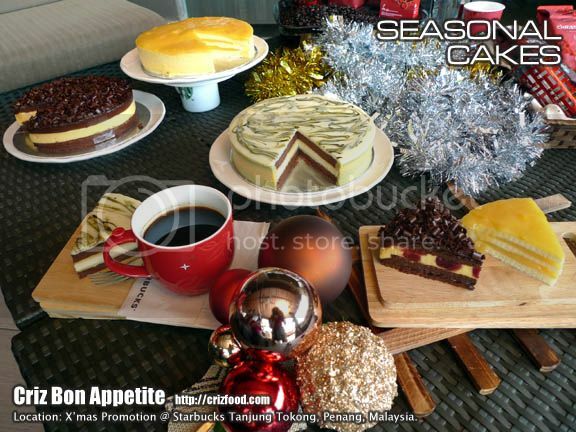 Each box with 10 pieces of freshly made pineapple cakes would be priced at RM45/box effective 30 December 2013 onwards. However, if you make your pre-order before the start of 2014, you would still be given a promotional price of RM38/box. Even before the production of the new packages, more than 500 boxes have been pre-booked. Thus, only a limited quantity of pineapple cakes are left for grabs (Only 250 boxes weekly for 4 weeks effective 30 December 2014). There is also a BONUS for all! For every 10 boxes ordered/bought, you can either opt for another box of pineapple cakes FREE if you collect them yourself or get your postage WAIVED if you are residing within Peninsular Malaysia. Last day for collection is on 26 January 2014. Hurry now to place your order to avoid any disappointment! You might ask, “Why Gartien Pineapple Cakes?” The reason is simple. As Malaysians, we ought to support our own local products. 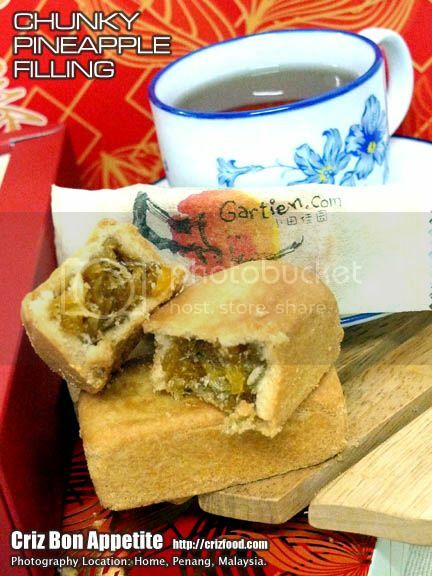 The pineapple filling itself is 100% home grown in Nibong Tebal, Penang, carefully handpicked and processed under strict quality control right in the heart of George Town, Penang. 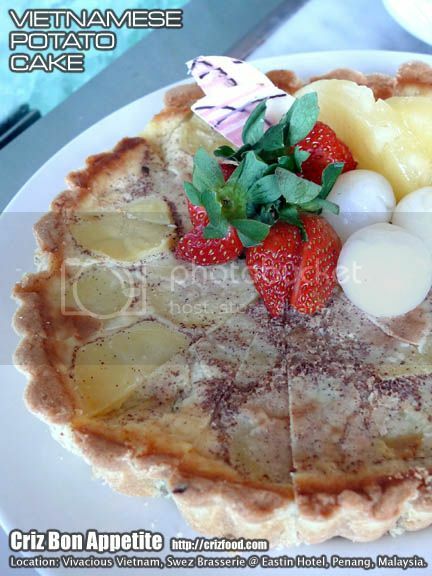 Secondly, the pineapples are brunoised instead of blended into puree. You would get pure bites on the texture. Combined with the hand crafted fresh pastry with the right fluffiness plus milky buttery flavors, it’s a snack that would leave many consumers yearning for more. What more it’s a great tea time snack to go with a cup of unsweetened tea. 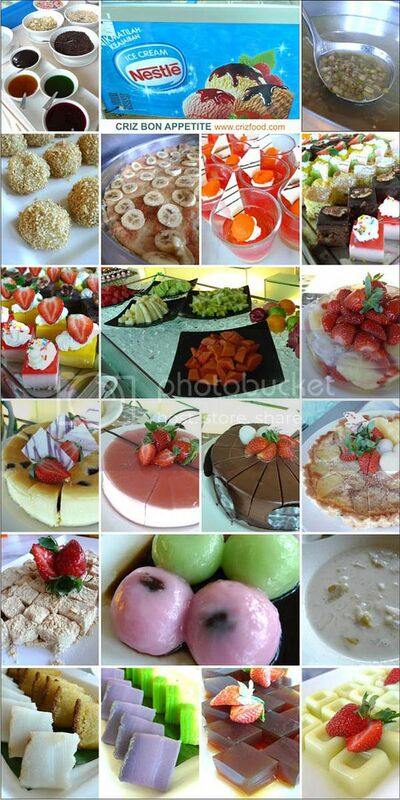 Finding the bakery won’t be hard as it is situated right in the heart of George Town, Penang. If you are coming from KOMTAR along Jalan Penang into Jalan Burma, just keep to your left. Immediately when you see Hong Leong Bank, turn left into Lorong Macalister. 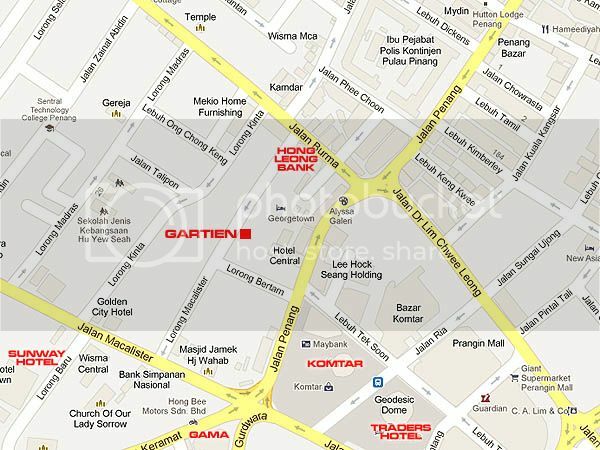 Drive on for about another 200m and you would see the shop on your left right before Lorong Bertam. 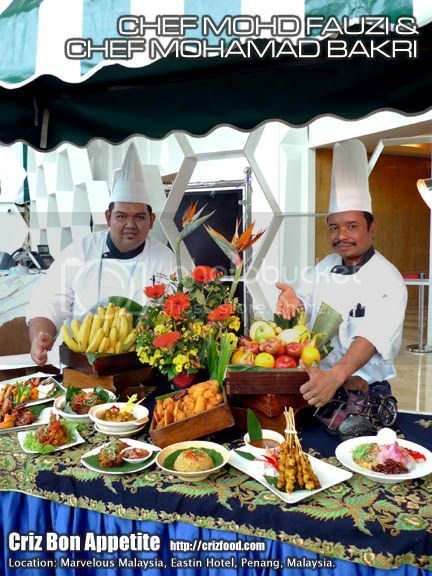 For the month of December 2013 (1-31 December 2013), the Swez Brasserie @ Eastin Hotel, Penang, would be having its International Flavors Promotion to tantalize your taste buds. 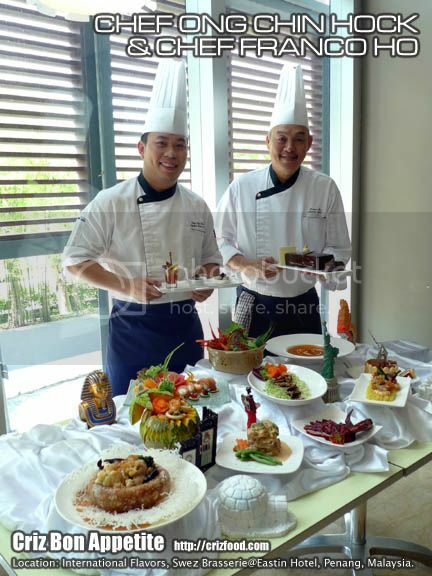 This promotion would be under the skillful hands of Chef Ong Chin Hock (Jr. Sous Chef) and Chef Franco Ho (Pastry Chef). 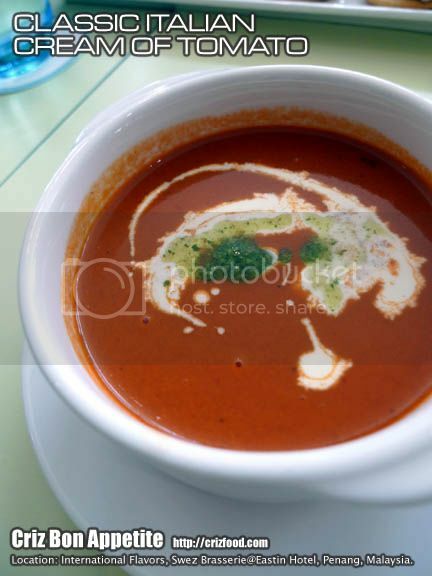 We started off the meal with a classic soup called Italian Cream of Tomato (意式番茄湯). It was creamy with full sweetness from ripened tomatoes with a mild tad of herbs and spices. Obviously, the thickness was from some usage of heavy cream. However, I personally felt it was a bit towards a sweeter taste that did not suit my taste bud all so well. 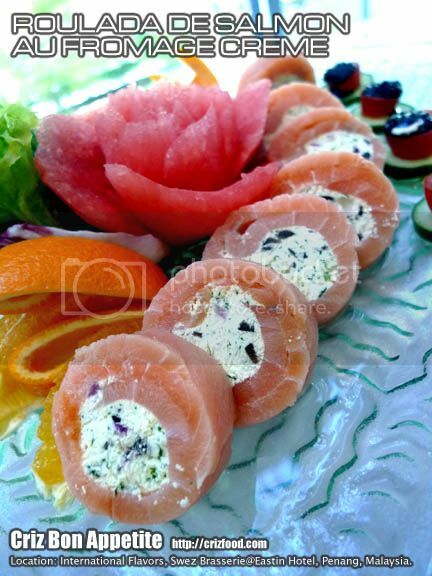 However, the appetizer of Roulade de Saumon au Fromage Crème (French Salmon Roulade with Cream Cheese Platter/法式鮭魚肉卷) was something to comment about. The freshness of the salmon combined with some herb infused cream cheese was something quite addictive. It seemed this was one of the dishes that won an award in a recent culinary competition. Thumbs up! 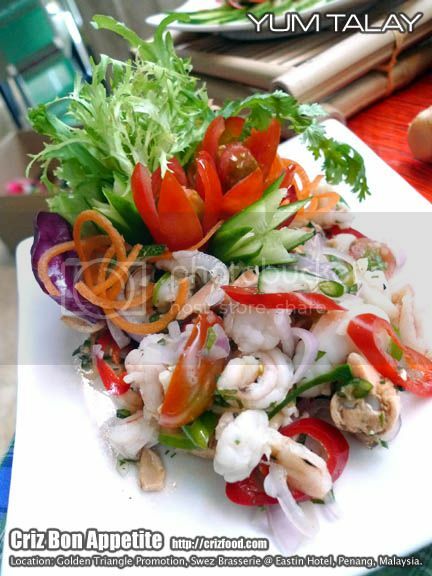 You would also be expecting something from Thailand, namely the Yam Talay (Thai Seafood Salad/泰式海鮮沙拉). When it comes to Thai cuisine, the balance of herbs and spices usages with a light touch of sweet and sourness would hardly go wrong. Moreover, combined with a few selections of fresh seafood, the dish was another winner for any buffet spread. Amongst the many canapé sections, you would expect to get some variations of tapas. 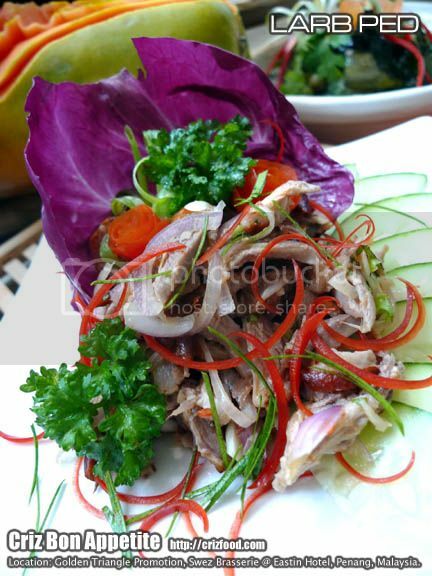 There were a few variants introduced such as the French Style Marinated Sardine (法式滷沙丁魚). 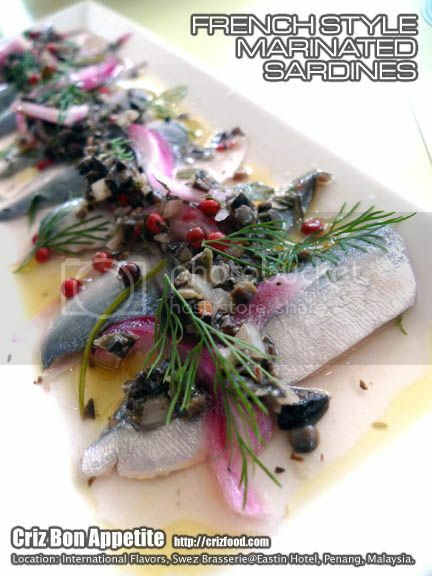 The main attraction of this appetizer was that the sardine slices were served raw but cured with some lemon citrus juice and infused with some red pepper corn and herbs. It was an interesting combination indeed and appetizing too. Another interesting tapas was the Eggplant Caviar (茄子魚子醬) served on cream crackers. 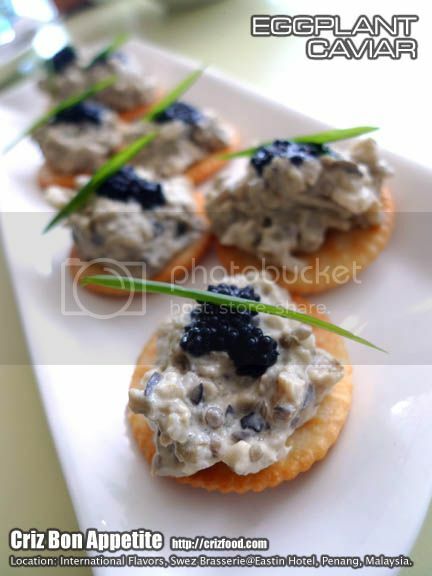 Though the preparation was simple, the mayonnaise added eggplant combination with some added lumpfish caviar was something light and delicious. The last of the tapas introduced was the Cheese with Dry Apricot & Turkey served with Apple Jam Sauce. It was not a bad combination at all. 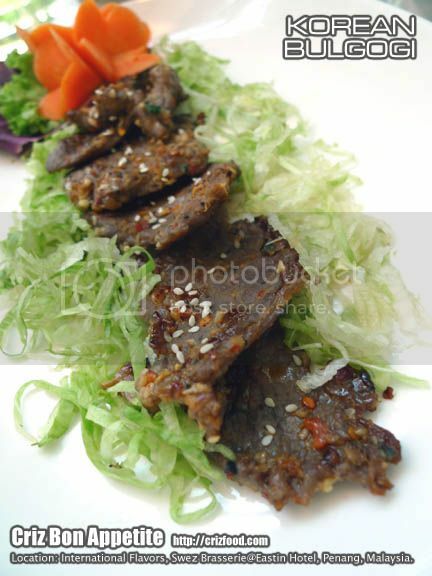 As for the main dishes, you would be expecting some Korean dishes such as the Korean Bulgogi (韓國烤肉). At first glance, you might think that the grilled beef slices might be tough. However, being marinated well with ginger juice as tenderizer and added garlic, chili flakes and sesame seeds, each bite was amazingly tender to the bite. There was also the Indian Curry Fish Head with Vegetables (印度咖哩魚頭). 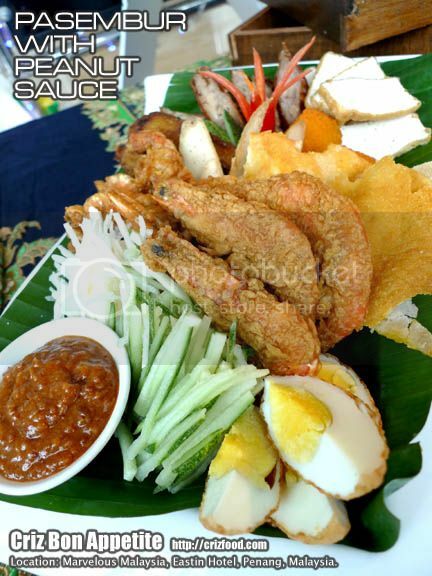 For Malaysians, this was one of the more common dishes in our daily spread of dishes. There was nothing much to brag about. One of the more prominent dishes that always caught my attention was the Hong Kong Style Roasted Duck with BBQ Sweet Sauce (港式烤鴨). The kitchen did quite a great job in roasting the duck with the right stuffing. 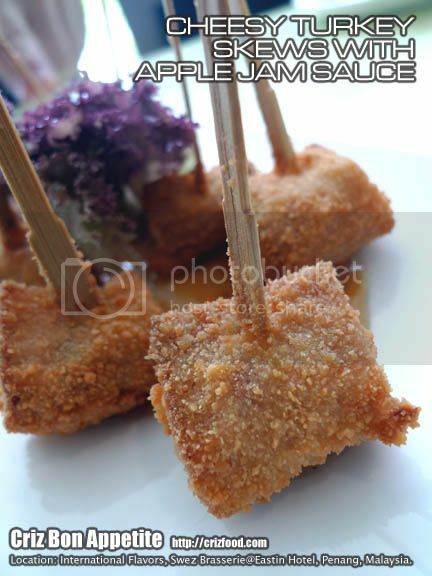 The pieces were tender and juicy and went well with the condiment of BBQ sweet sauce. What caught my attention most was the Frango comleit de coco Brasileira (Brazilian Chicken with Coconut Milk/巴西椰奶雞). The creamy coconut milk concoction with a mild touch of herb, lemon juice and some finely diced tomatoes went well with the pan-fried boneless chicken. This dish would be great with some bread or tortillas. Chinese Classical Loh Han Chai with Yam Ring (玉環羅漢菜) was also served. I personally felt that the yam ring would go better with some stir fry vegetables and chicken. 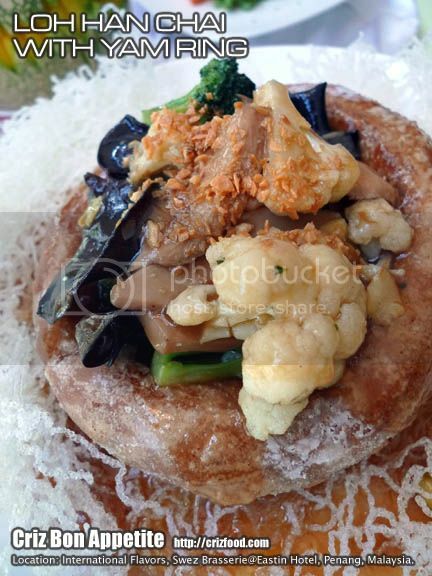 The fermented bean curd usage in the dish somehow overpowered the fragrance from the nicely fried yam ring. We were also served with some French Prawn Persillade (法式香菜蝦). This was just some king sized prawns sauteed in some chopped garlic plus parsley and served with curry infused couscous. Last but not least, we ended our meals with two delicious desserts. One of them was the Italian Classic “Pick Me Up” Tiramisu (法式提拉米蘇) while the other was the American Dark Chocolate Mud Cake (黑朱古力泥蛋糕). Overall, the theme for this December month can be quite interesting as it has the cuisine from all over the world. 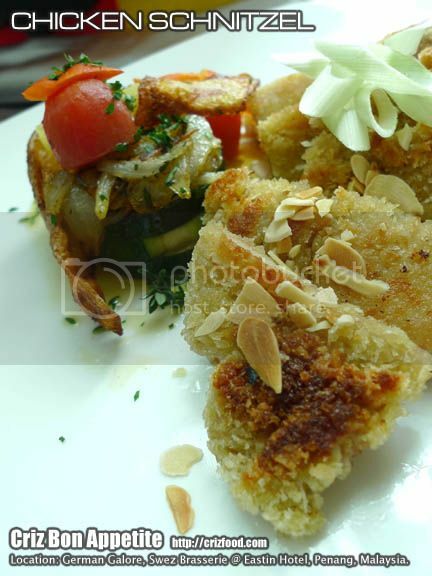 Do check out the different display of tapas to tempt your taste buds. Here’s the summary of the International Flavors Promotion. For MAYBANKARD, Standard Chartered Bank, OCBC Bank, CIMB Bank and CITIBANK card members, you can enjoy 15% discount for the Herbs & Spices Semi Buffet Dinner (Monday to Thursday) and Weekend Buffet Dinner (Friday to Sunday) from 6.30pm – 10.00pm. 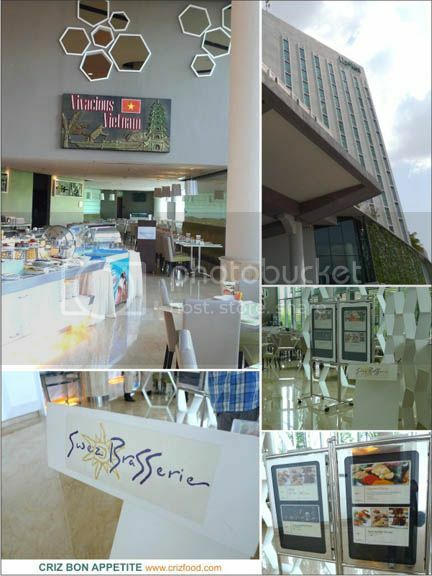 The Swez Brasserie is located at the right wing of Eastin Hotel, Penang (next to Queensbay Mall). If you are coming from Georgetown towards Bayan Lepas Free Trade Zone via Bayan Lepas Expressway, do watch out for the Pulau Jerejak signboard (leading to Pulau Jerejak jetty). Ignore the turning and drive on to the next left junction. Turn left into Jalan Aziz Ibrahim and drive on until you a roundabout. Turn 3 o’ clock and drive on until you see a big Eastin Hotel signboard at the first right junction. Turn right and drive on. Park your car at the basement car park. Take a lift to the first floor lobby and you would see the restaurant there. 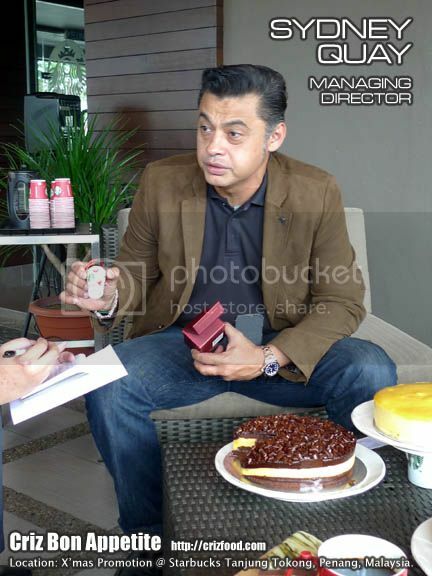 I’m sure I need not have to mention much about Starbucks® in Malaysia as most of you would have known the brand throughout their 15 years of operations in Malaysia. 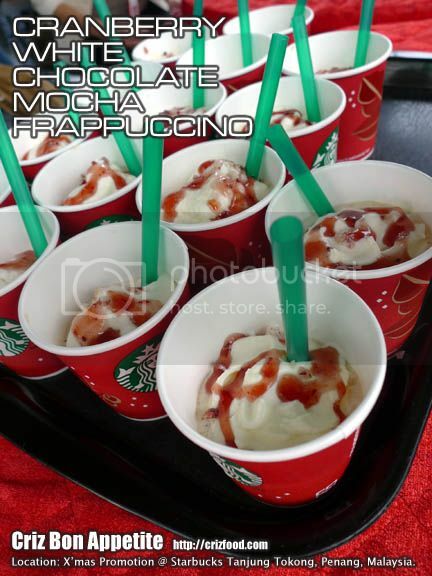 It’s operated by Berjaya Starbucks® Coffee Company Sdn. 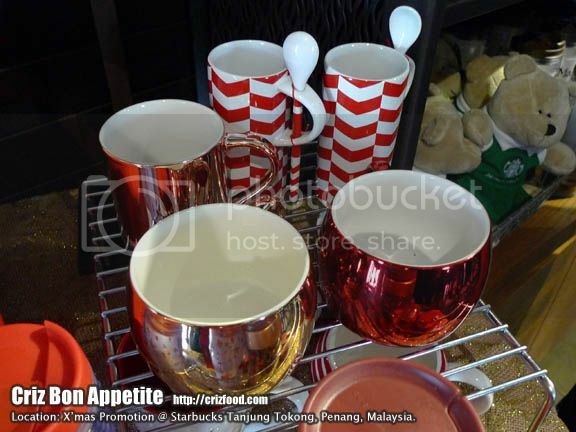 Bhd., a joint-venture between Starbucks® Coffee International and Berjaya Group Berhad. 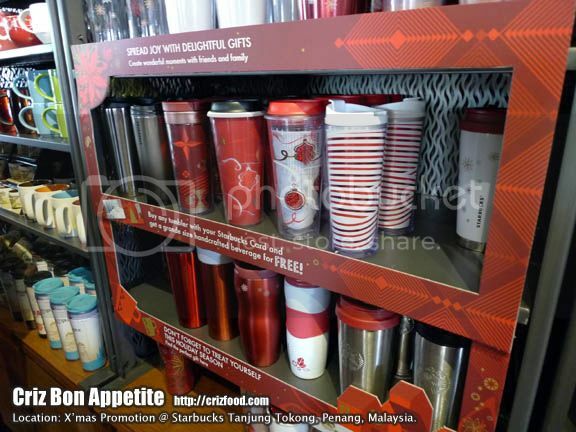 With over 150 outlets and ‘drive-thru’s throughout Malaysia since their first store opening in Kuala Lumpur on 17 December 1998, Starbucks® promised to bring in more great deals during this Christmas 2013 (Promotion period: 6 November 2013 – 6 January 2014) based on the theme “Create Wonder and Share Joy with Favorite Seasonal Traditions”. 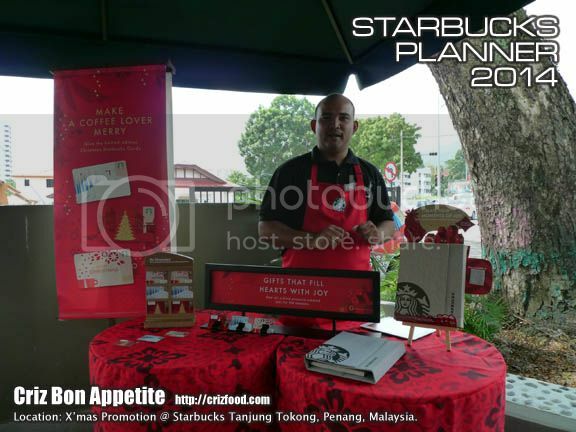 We had a fun-filled briefing on the seasonal promotion at Starbucks® Drive-Thru, Tanjung Tokong, Penang recently. 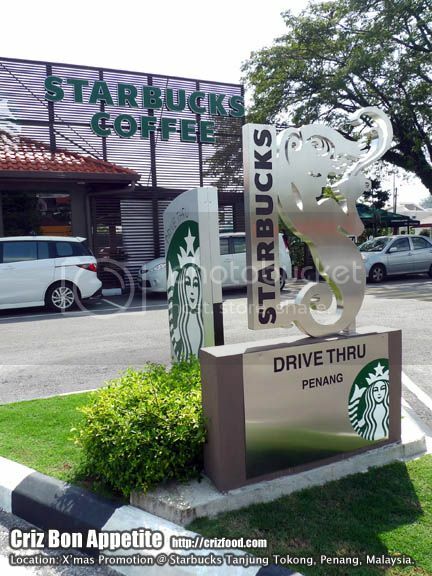 “Starbucks® Drive-Thru Tanjung Tokong is the most profitable drive-thru outlets amongst all six throughout Malaysia. 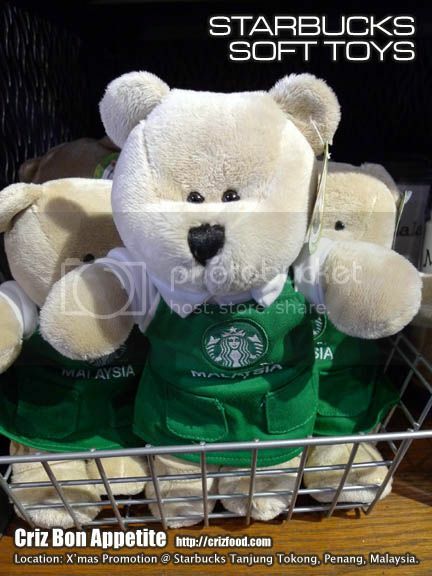 It’s also the outlet with the most completed merchandises in Penang,” stated Sdyney Quays, Managing Director of Berjaya Starbucks® Coffee Company. Amongst the once-a-year favorites would be their freshly brewed Starbucks® Seasonal Favorite Coffees (RM40 for 250g coffee beans pack or RM33 for 12 sachets of ready brew packs), the perfect salute for each season. 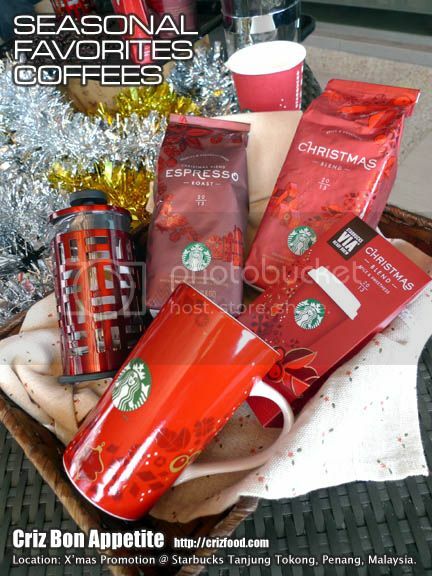 These are the Starbucks® Christmas Blend (Whole Beans or VIA Ready Brew Christmas Blend), a dark roasted coffee with a blend of lively Latin American coffees and smooth Asia Pacific coffees, including rare, aged Indonesian beans; full bodied, medium acidity with soothing sweet, spicy plus herbal aromas and Starbucks® Christmas Blend Espresso Roast, a darker espresso roast with sweeter and dense flavors to the mellow smoothness of the Asia Pacific beans. There are also 3 new flavors of delicious cakes introduced this year. All cakes would be priced at RM10.90/slice. 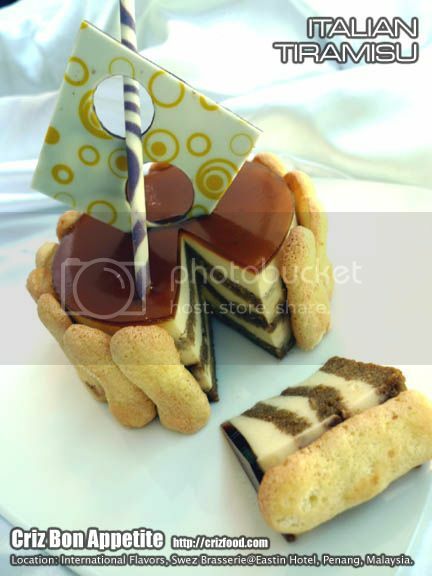 The most notably one would be their Trio Forest, a rich moist chocolate cake, stuffed with juicy caramelized dark cherries, topped with a layer of chocolate ganache and beautifully presented with a generous amount of shaved chocolate flakes. The Mango Tango which had mango slices stuffed between layers of light sponge cake would be ideal to go with the Starbucks® Christmas Blend. The Midori on the other hand was also unique by itself. The trio layered sponge cake had a topping of cream cheese with slathered pistachio dressing. Christmas is a time to create wonder and share joy with family and friends over stories, memories and delicious Starbucks® food and beverages. 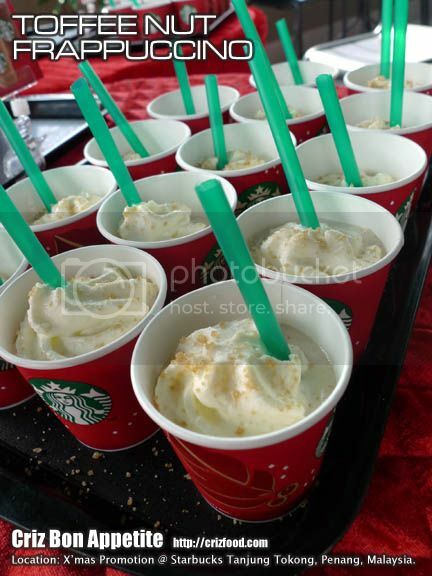 Again this year, Starbucks® is bringing back their Christmas beverages with a bit of twist from last year’s. 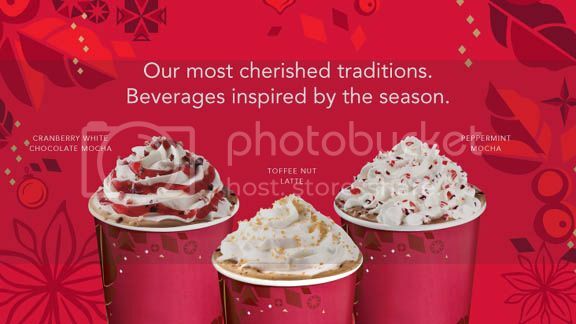 You can now enjoy their enhanced versions of Toffee Nut Latte, Toffee Nut Frappuccino® blended beverage, Peppermint Mocha Frappuccino® blended beverage and Cranberry White Chocolate Mocha Frappuccino® blended beverage. Toffee Nut Latte Frappuccino® is a flavorful holiday beverage. It has the rich, buttery flavor of sweet toffee combined with toasted nuts, blended with their smooth espresso and velvety steamed milk. Topped with whipped cream and toffee-flavored sprinkles, it’s no surprise that this warm, heavenly beverage is sure to put you in the mood for Christmas. 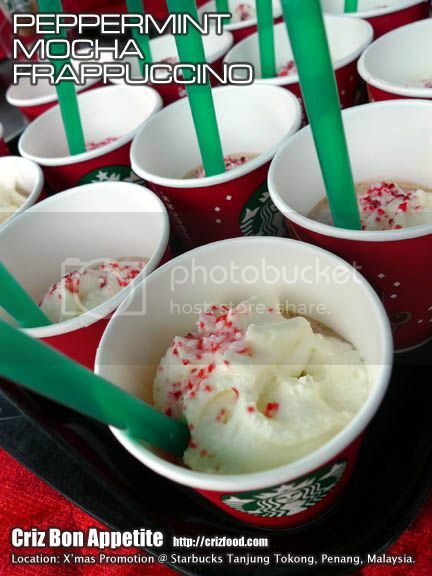 The Peppermint Mocha Frappuccino® is another great beverage for peppermint lovers. It has a combination of espresso, steamed milk, bittersweet chocolate and peppermint flavor in this seasonal favorite. Topped with classic whipped cream and a light sprinkles of Christmas cane candies, the Peppermint Mocha is brimming with Christmas cheer that is sure to please. Back by popular demand, the Cranberry White Chocolate Mocha Frappuccino® is the perfect sweet treat to sip during this season. Starbucks® signature espresso is combined with freshly steamed milk and luscious white chocolate, then topped with whipped cream, a tart cranberry drizzle and crystallized cranberry sugar. 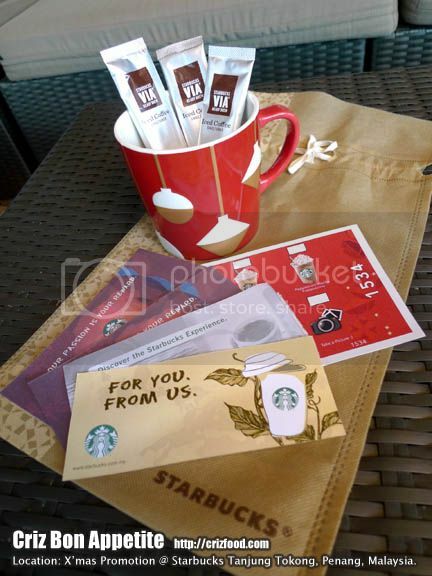 Another gifting option or even as collectible items would definitely be the Starbucks® Card. 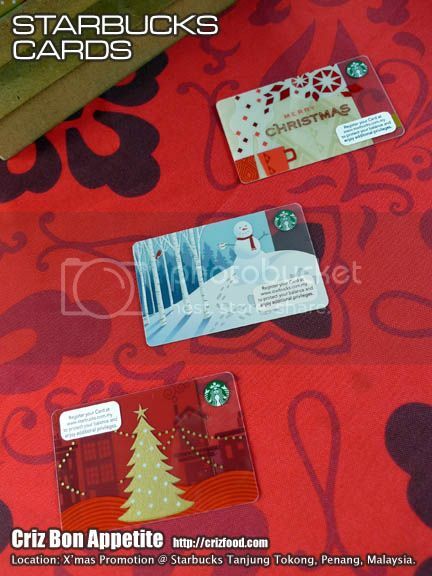 This year, Starbucks® had added another new card design named “Merry Christmas”. 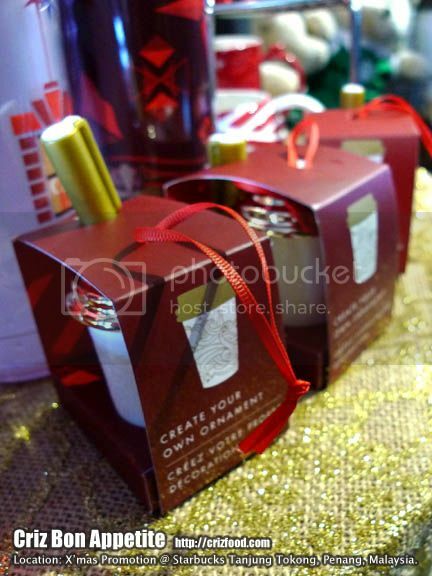 You would have the options to choose from the 3 distinctive designs, namely “Merry Christmas”, “Snowman” and “Christmas Tree”. Do grab either one of the limited edition designs or maybe all if you are into collecting them. Each card required a minimum activation fee of RM30. 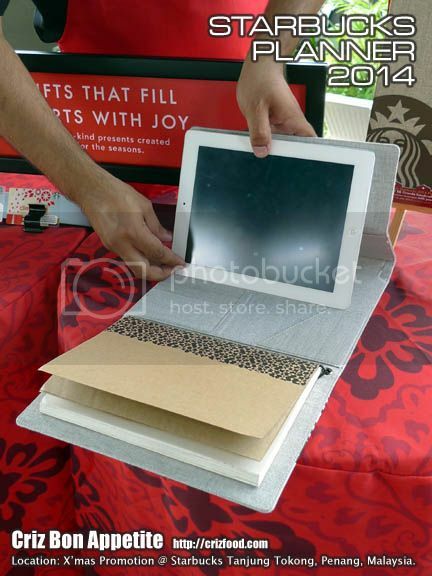 Also available this year would be their limited edition Starbucks® Planner 2014 which has a special compartment to store your iPad. Priced at RM159 each, this planner could also be redeemed FOC via certain termed purchases by mode of your Starbucks® Card. The requirement of purchases would be any 3 purchases of the Christmas beverages plus 15 purchases of “Grande sized” beverages. Terms & conditions apply. Planning to set the Christmas moods with more giving and sharing? 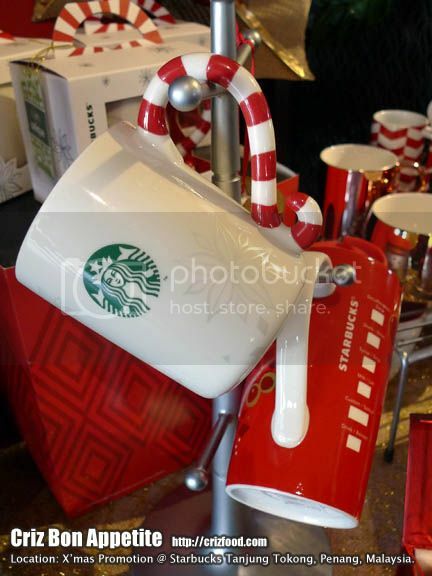 There are more than 60 items at each Starbucks® outlet, ranging from Starbucks® Seasonal Favorite coffees, Starbucks® Card, Starbucks® Planner 2014, Starbucks® soft toys, Starbucks® mugs, Starbucks® tumblers, Starbucks® Christmas ornaments and more for you to choose. 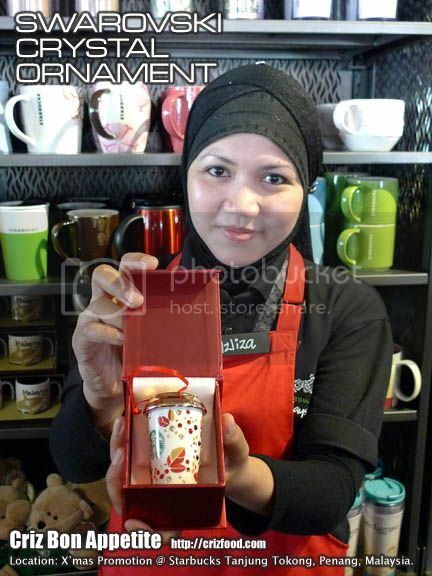 The most notable one would be the Swarovski crystal studded Starbucks® Christmas ornament priced at RM185. Address: 4-G, Jalan Pantai Molek, Tanjung Tokong, 10470 Penang, Malaysia. 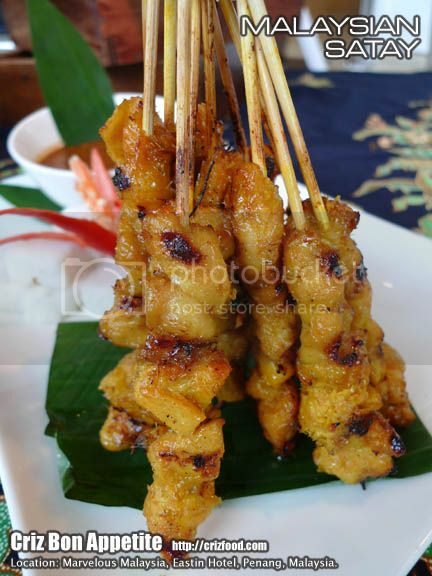 If you are in for an exotic spread of spicy, sweet and sour dishes from the regions of Laos, Myanmar and Thailand, you should check out the Golden Triangle Promotion at Swez Brasserie @ Eastin Hotel, Penang, for the month of April 2013 (1-30 April 2013). 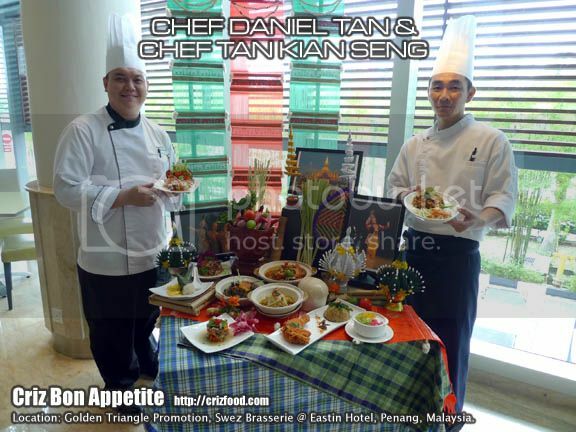 This promotion would be under the skillful hands of the Executive Sous Chef, Chef Daniel Tan and Guest Chef, Chef Tan Kian Seng (陳湕勝), who has over 2 decades of culinary experiences in various local hotels, specializing in Chinese and Thai cuisine. To start off the meal, we had a Laotian appetizer called Larb Ped (老撾辣鴨沙拉). 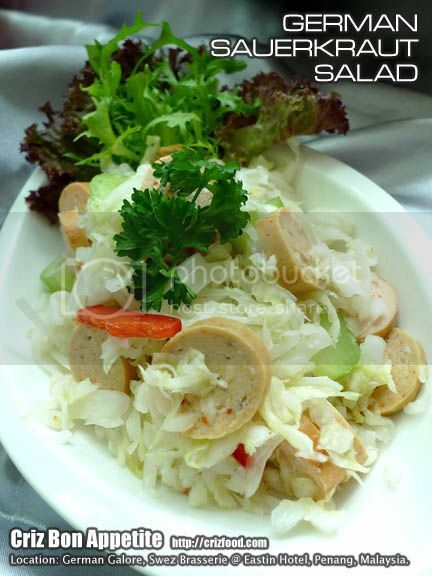 This salad is also quite popular in Thailand until some diners would have the thoughts that it was originated from there. The preparations between both regions were in fact quite similar except that the Laotian had a milder spiciness from the strong usage of bird eye chilies. I quite like this Laotian version though it lacked the burning sensation of the Thai’s “Larb/meat salad” version such as the Spicy Minced Pork Salad (Lab Moo Sub/ลาบหมู) which contained a secret ingredient – coarsely blended toasted raw rice grains. Another appetizer that I quite like was the Yum Talay (Thai Spicy Mixed Seafood Salad/泰式香辣海鮮沙拉/ยำทะเล). 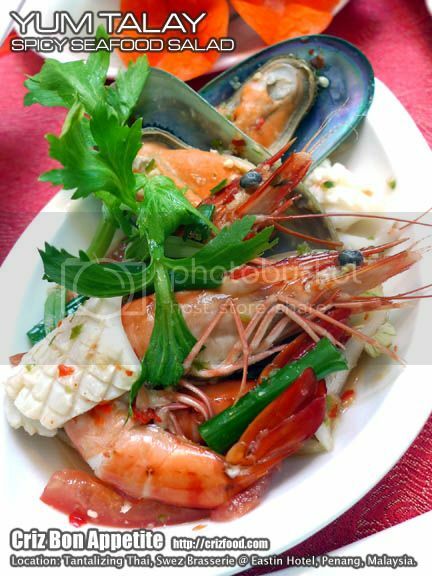 The dish had a seafood combination of cooked prawns, and mussels, together with some big onions, cucumber, tomatoes, red chilies, coriander, and spring onions, all tossed in a spicy, sweet and sour dressing. Though nice, I personally felt that it needed a little more pepping up of fish sauce (nam pla/น้ำปลา) to bring out the authentic Thai flavors. 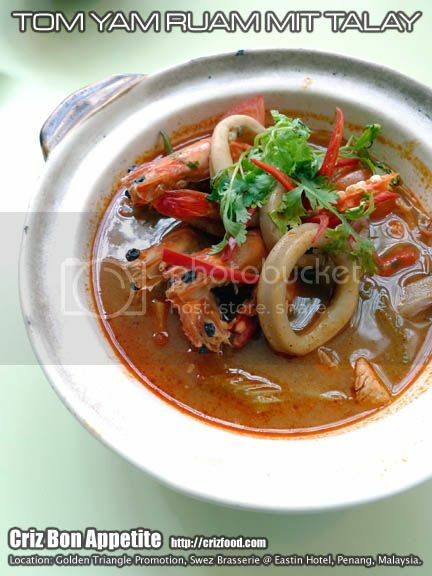 Of course, we also had the ranked #4 dish in the Readers’ Choice: Top 50 Most Delicious Food by CNNGo – Tom Yam Goong (Thailand’s Spicy Prawn Soup with Lemongrass & Chili/泰式香茅鮮蝦東炎湯/ต้มยำกุ้ง) which has the unique unity of the 4S tastes – spicy, sour, sweet and salty. However, we had a bonus too as the soup also came with some mixed seafood of fish, squids and mussels. I guessed they should have named it Tom Yam Ruam Mit Talay (Thai Spicy Mixed Seafood Tom Yam/泰式酸辣海鮮東炎湯/ตมยามรวมมีดทะเล) instead. Do consume this soup while it’s hot or it may have a heavier salty aftertaste. 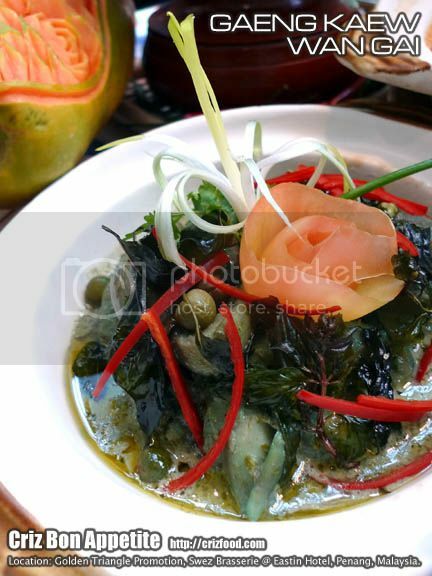 As for the main course, you would have the Gaeng Keaw Wan Gai (Thai Green Curry Chicken/泰式青咖哩雞/แกงเขียวหวานไก่). Thai Green Curry Chicken has always been my favorite as I always love the fresh taste Thai basil leaves, kaffir lime leaves and Thai eggplant. However, I detested the bright green coloring on the chicken pieces though they have been marinated naturally overnight with the fresh juices of capsicums and parsley. I rather have them in their natural state. 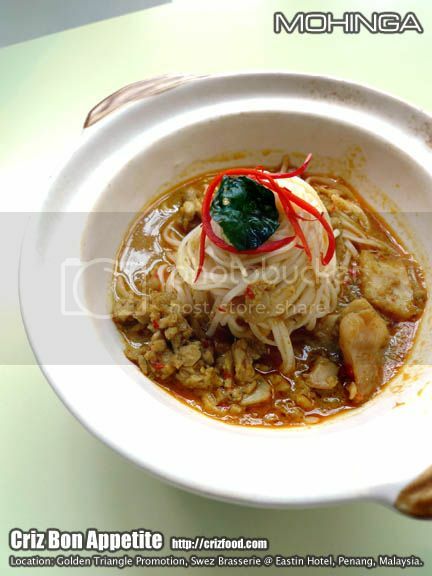 Another of the main courses would be the Mohinga (Burmese Fish Noodles/Burmese Laksa/緬甸魚面). I’m a frequent consumer of the Mohinga, cooked the traditional way by actual Burmese and I found the ones served here to lack the volume and balance in ingredients. Basically, it was just fish gravy on rice vermicelli (the local version instead of the actual version where gram flour/chickpea flour/chana dahl is used) with Thai basil and red chilies as garnishes. Though the fish gravy had the standard flavors but the whole dish lacked the crunch, creaminess and spiciness. They should have added in some sliced raw snake beans, hard boiled eggs, fried split chickpea fritters, fish cakes and sliced coriander leaves with a separate serving of chili flakes for that extra spiciness. At least, by doing so, it would not be so astray from the traditional recipe. You would also get to try out the Or Lam (Laos Green Vegetables Stew/老撾燜蔬菜). There is actually no fixed recipe for Or Lam as you can practically put in whatever you have in small quantities, may it be vegetables, meat or fish (sometimes can be known as Or Ro). 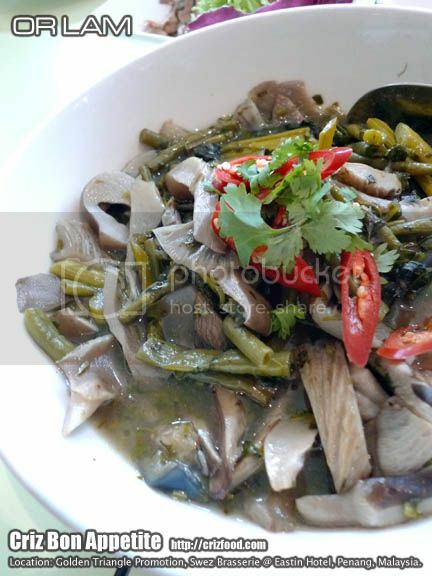 What we had here basically consisted of morning glory, mushrooms and eggplant stewed together in a mildly spicy and thick meat broth with a mild hint of lemongrass being used. The dish was nothing fanciful but was good enough for those who love mushrooms a lot. 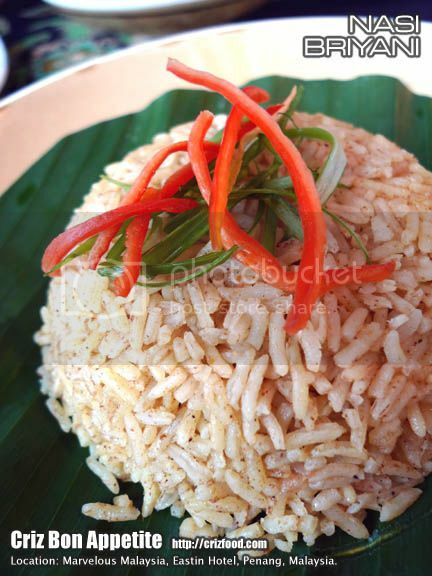 You might also get Khao Mok Gai (Laos Steamed Chicken Rice/老撾雞飯). 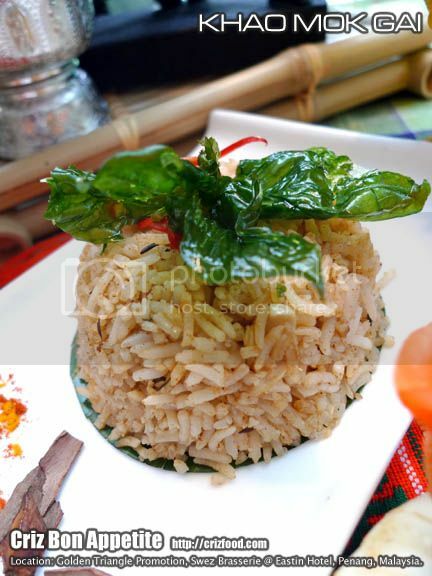 This dish is almost similar to the Malaysian Style Nasi Briyani, except this hybrid Laos/Thai version had a milder or non usage of turmeric or saffron. The taste of the Laos version had some slight differences in fragrance as it was not as aromatic as the Malaysian’s without the usage of ghee or butter. 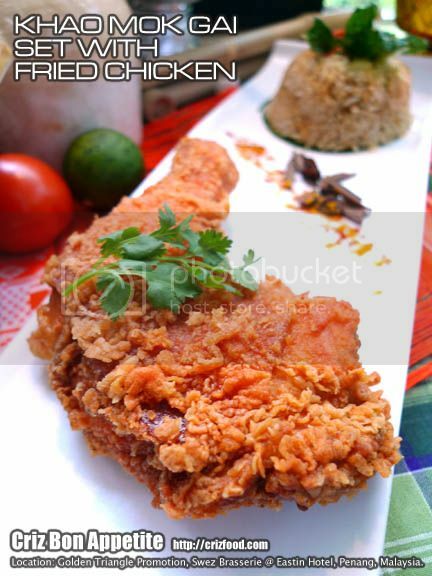 This Laos steamed rice may come with a deep fried chicken as one of the options during semi-buffet. Another option for the semi-buffet would be the Pad Thai (Thai Style Stir Fry Flat Noodles/泰式炒粿條/ผัดไทย), ranked #5 in the revamped list of Readers’ Choice: Top 50 Most Delicious Food by CNNGo. I’m sure you would like this stir fried flat noodles with eggs, fish sauce, tamarind juice, deep fried bean curd, chives and prawns with some condiments of crushed peanuts, sugar, chili flakes, lime and more. 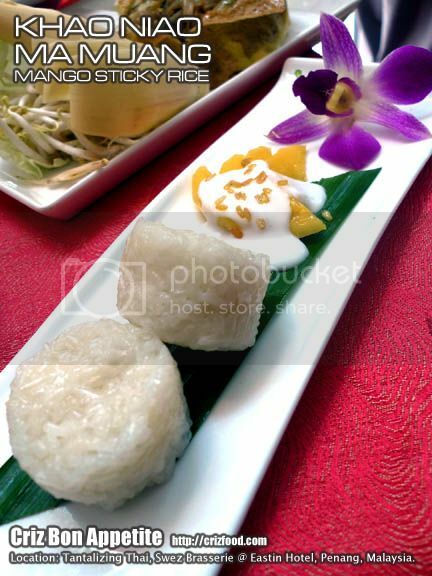 As for dessert, we had Khao Neaw Mamuang (Mango Sticky Rice/香芒椰漿糯米/ข้าวเหนียวมะม่วง). 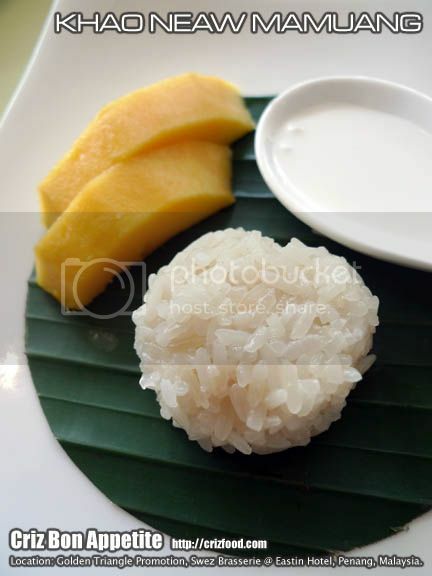 The coconut milk steamed glutinous rice was served with some slices of hybrid local mangoes and some slightly salted coconut cream. Taste wise, it was normal as I prefer those with fresh coconut cream instead. 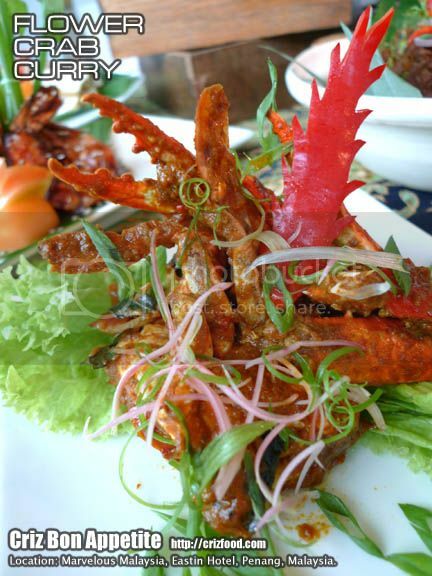 Moreover, it lacked some extra flavors from some deep fried mung beans or toasted sesame seeds as garnish. Another dessert we had was the Tub Tim Krob (Jellied Water Chestnut Rubies with Jackfruit in Coconut Milk/泰式馬蹄椰漿露/ทับทิมกรอบ). Frankly speaking, I do not quite like this dessert here. Firstly, it was the boxed coconut milk being used. 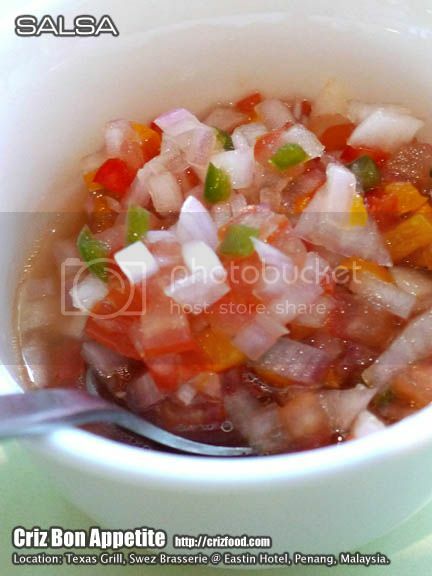 Secondly, it was the jellied water chestnut rubies was diced too fine and lost their crunch. 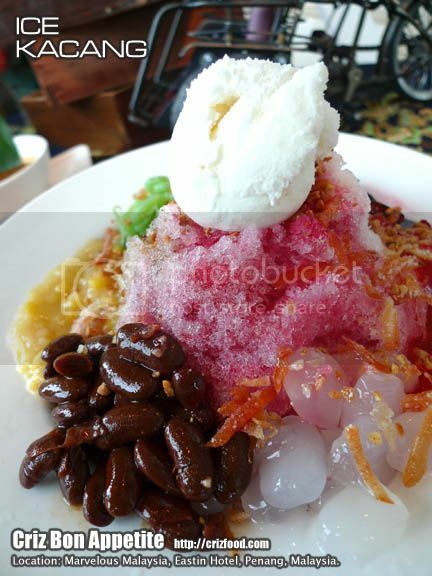 Thirdly, they can forget about adding the cendul in there as the frozen texture of the “pandan noodles” was totally out. I guessed the kitchen ought to revamp the whole dessert properly before serving its diners. Overall, some of the dishes served here still have rooms for improvements as the taste and flavors were rather localized. Somehow, the recipes for the dishes were a bit way too out in flavors compared to those traditional ones and did not attract much of my attention anyway. Let’s hope they will come out with more authentic flavored dishes for this promotion. Here’s the summary of the Golden Triangle Promotion. For MAYBANKARD, Standard Chartered Bank, OCBC Bank, CIMB Bank and CITIBANK card members, you can enjoy 15% discount for the Golden Triangle Semi Buffet Dinner (Monday to Thursday) and Weekend Buffet Dinner (Friday to Sunday) from 6.30pm – 10.00pm. For meat lovers, especially beef and poultry lovers, you are in for a meaty treat this coming October 2012 as Swez Brasserie @ Eastin Hotel, Penang, would be having its German Galore Promotion for the whole month of October 2012 (1-31 October 2012). 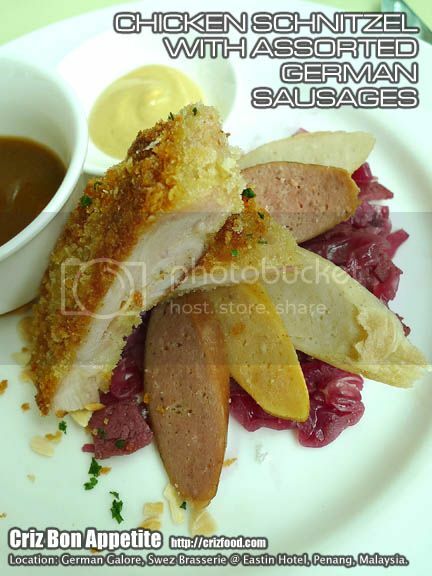 You can now savor all the delectable spread of German cuisine under the skillful hands of the Jr. Sous Chef, Chef Kelvin Cheong. However, you won’t be able to try out any pork related items the Germans are famous for as the restaurant is halal. For MAYBANKARD, VISA, CIMB and UOB card members, you can enjoy 15% discount for the Semi Buffet Dinner (Monday to Thursday) and Weekend Buffet Dinner (Friday to Sunday) from 6.30pm – 10.00pm. 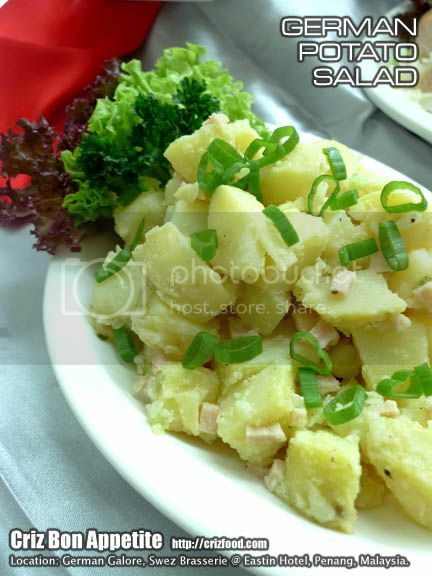 One of the main appetizers of the day would surely be the German Potato Salad (德式馬鈴薯沙拉). This nicely chilled authentic German salad recipe had me digging in for more. It was a simple dish with just a few ingredients and yet the slight creamy and sour flavors in it were truly refreshing and appetizing. Can you imagine a dish with just diced potatoes, diced onions, diced turkey ham, black pepper, vinegar, salt & sugar to taste with a light sprinkles of chopper spring onions can be so fulfilling? Yummy! The next appetizer was the German Sauerkraut Salad (德式酸菜沙拉). The sauerkraut which is basically shredded cabbage and sugar under pickling processes through lacto-fermentation, had that slight sourness. When combined with some sliced celery, capsicum, onions and tossed with some sliced bratwurst, it was another great dish to start off prior to a heavy and meaty meal. As for main, we had an assortment of German Sausages (Bratwurst) and Chicken Schnitzel served on Rotkohl, with Onion Sauce (with diced turkey ham) and Dijon Mustard as condiments. The Germans are the experts in making wurst (sausages) for centuries and they claimed to have created more than a thousand types of wurst throughout Germany, with variants in different regions of course. Their wurst basically falls into 4 categories such as Rohwurst (fresh/raw), Kochwurst (cooked), Buchwurst (boiled/scalded) and Bratwurst (grilled/pan-fried). There are also the schinken (hams) such as the Rohschinken (fresh/raw), Kochschinken (cooked) which would be ideal for topping breads. We managed to try out 5 types of the wurst (chicken & beef) such as the Bratwurst, Foot Long and Weisswurst. The Chicken Schnitzel (德式雞排) on the other hand was a hit amongst us. The golden breadcrumbs crusted boneless chicken thigh meat had just the right marinates with a mild touch of parmesan cheese, butter, pepper and a light hint of lemon juice. It was perfect with some sprinkles of roasted almond flakes for the extra crunchiness. 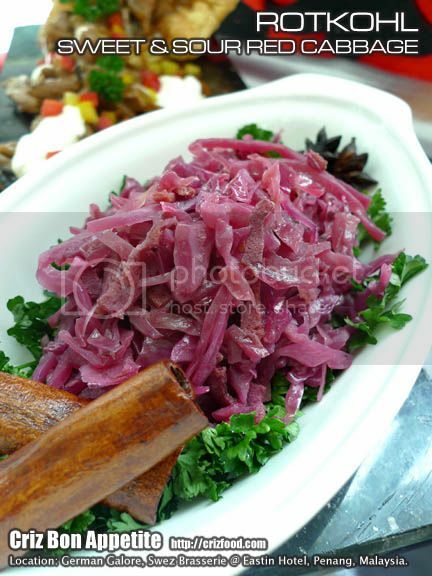 One of the side dishes that came severed with the main dishes was the Rotkohl (Sweet & Sour Red Cabbage), another staple dish in Germany. Compared to the Sauerkraut, this dish had a more distinctive tangy sweetness from some added apple cider and spices such as cloves and cinnamon barks. Some toasted turkey bacons were added in for a mild tad of saltiness. This dish went well with all the meat dishes. 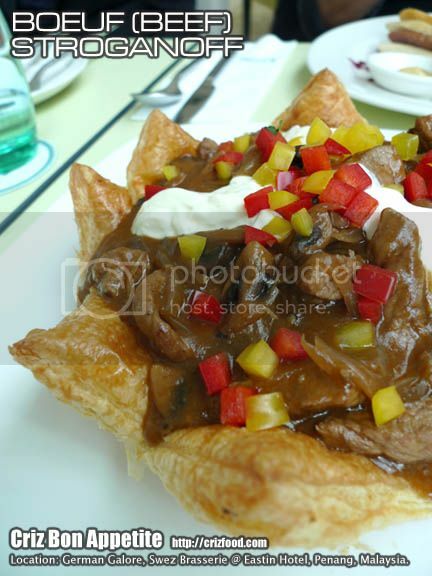 Another of the main dishes served was the Beouf (Beef) Stroganoff on some puff pastry. This is quite a flexible dish as it can be use to top any of the starches such as rice, noodles, pasta, bread and more. The taste of this dish was quite similar to those beef stews except that it was rather mild in spices. Basically, you can taste the natural sweetness from a high usage of onions, mild peppery taste from some mustard and black pepper, earthly taste from some mildly sauteed mushrooms and some creamy and sour flavors from the added sour cream. The only doubt I had was on the origin of the dish. It was to be a Russian dish but got famous throughout the surrounding countries and the Germans also claimed it as theirs. LOL! A meal won’t be complete if you did not have the national dessert of Germany – the Schwarzwalder Kirschtorte (Black Forest Cake) or simply known as the Black Forest Cherry Torte. Resident Pastry Chef, Chef Franco Ho did a great job here by producing the most amazing slice of cake I had for a long time. 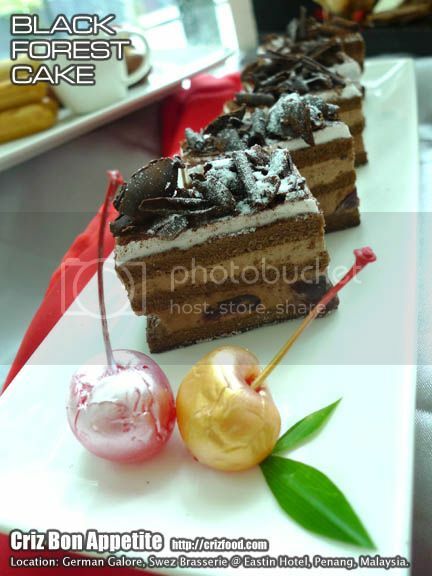 The cake was filled with the right sweetness of cream with added juicy black forest cherries. Thumbs up! Another two desserts that got the Germans munching practically any time of the day was the Berliner (Berlin Donuts) and Pretzels. 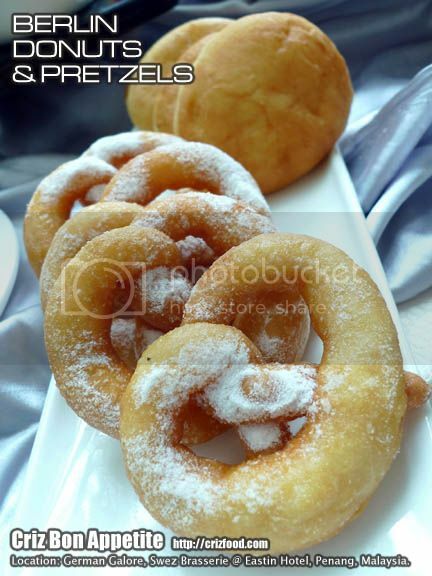 The Berliners were simply deep fried yeast dough balls with custard, crème or jam fillings. On the other hand, the Southern Germany favorite of Pretzels came plain with some sprinkles of icing sugar. This light snack would be great if dunked into some black coffee, especially those filtered coffee. Overall, Swez Brasserie had its limitation in serving the German cuisine as pork remains the most popular choice of meat in Germany. Due to the restriction in serving pork related dishes, you would see more of chicken, beef or turkey being used as alternative ingredients. The taste of the dishes might differ significantly from the authentic ones by this substitution of meat choices. I do hope there would also be some German schinken (hams) being served during the actual promotion dates rather than having only German wurst (sausages). For bread, it would be great if they also have some of the famous ones such as those with sourdough and/or Pumpernickel, a deep brown colored steamed, sweet-tasting rye bread. These bread choices would be lovely to go with the meaty dishes such as the Beef Stroganoff or maybe Kartoffelsuppe, a potato and wurst soup. I guessed the kitchen should consider serving some German soup as well for those light eaters. There are many soup options in Germany such as the Gebundene Ochsenschwanzsuppe (German Oxtail Soup), Ueberbackene Zwiebelsuppe (German Onion Soup), Graupensuppe Eintopf (German Barley Soup with Bacon) or even a simple Erbsensuppe (German Pea Soup) to consider. For MAYBANKARD & VISA card members, you can enjoy 15% discount for Texas Grill Semi Buffet Dinner (Monday to Thursday) and Weekend Buffet Dinner (Friday to Sunday) from 6.30pm – 10.00pm. Swez Brasserie @ Eastin Hotel, Penang is promoting its Chinese Cuisine for the whole month of September 2012 (1-30 September 2012). 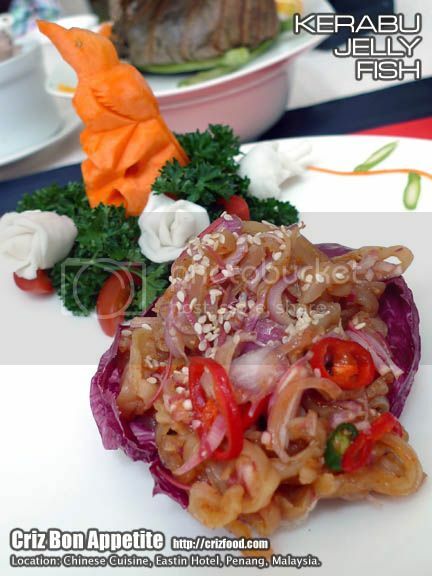 There would be an array of halal Chinese dishes ranging from appetizers, main dishes and desserts to fill your appetite. This promotion would be arranged under the skillful hands of Chinese Chef, Chef Cheah Teik Huat and Jr. Sous Chef, Chef Ong Chin Hock. For the month of September, there would also be a 15% off the bill for all MAYBANKARD, VISA, CIMB and UOB card members. 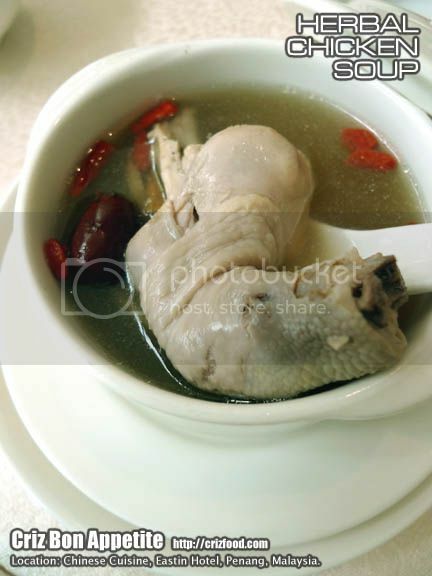 As for appetizer, we started with a bowl of Herbal Chicken Soup each. The soup was rich in herbs flavors which basically consisted of Chinese Angelica (Dong Quai/當歸), Codonopsis Pilosula (Dang Shen/黨參), Rhizoma Polygonati Odorati (Polygonatum odoratum (Mil.) Druce/Yu Zhu/玉竹), Red Dates (Jujubes/紅棗) and Wolfberries (Goji Berries/枸杞). Based on the Traditional Chinese Medicine (TCM) practice, this herbal soup is great to enhance energy (Qi), nourish the Yin, moisturize the lungs, Alleviate dryness and promote blood circulation. This was one soup most Cantonese would love to have in their meals occasionally. The next appetizer was Kerabu Jelly Fish. Although I quite like the chewy texture on the jelly fish, I found the dish to be out of the Chinese cuisine ingredient list. 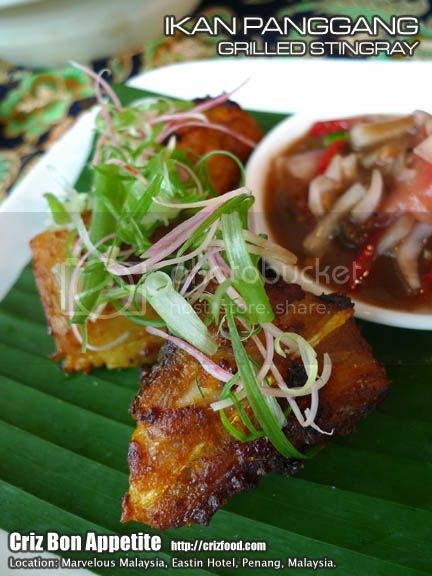 It was more of a Peranakan (Nyonya) cuisine. I would think that this dish would be best served chilled the traditional Chinese method by mixing with some soy sauce, sesame oil, chili oil and vinegar with a light touch of sugar. As for main courses, we had Fried Rice in Lotus Leaves. 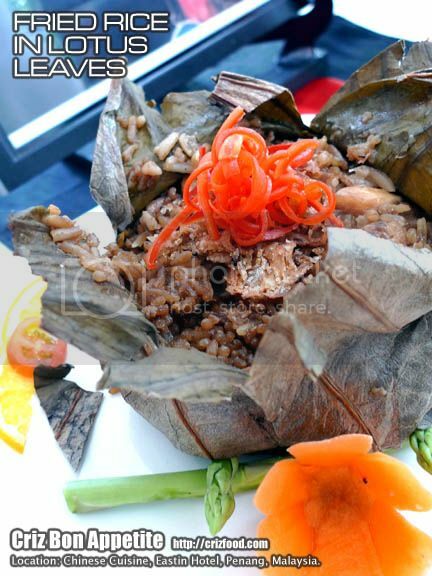 You can taste the flavor of the lotus leaves richly infused into the fried rice. It had some dried shrimps, mushrooms and cubed chicken slices added into the rice. However, it lacked the flavors from some added Chinese sausages – the halal version, since they can’t serve pork ingredients in the restaurant. Next on the list was the Stir Fry Vegetables Treasure. 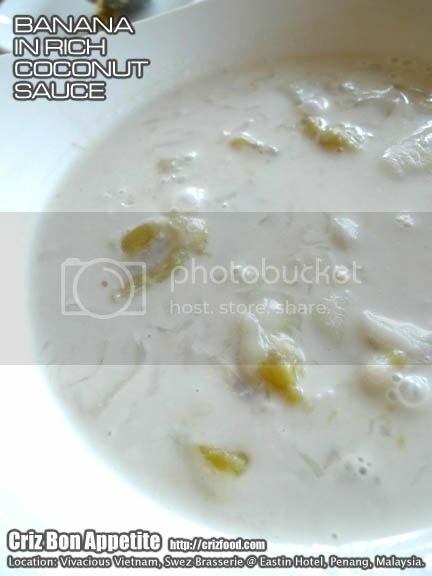 It was just a simple starch gravy dish with various blanched vegetables added in such as white cabbages, mustard stems, water chestnuts, Chinese mushrooms, button mushrooms, ginkgo nuts, asparagus and carrots. The Roasted Garlic Marinated Chicken was quite nice indeed as you can taste the right combination of seasoning on each of the chopped pieces. The condiment which consisted of slightly sauteed chopped garlic, blended ginger, spring onions, Chinese parsley, sesame oil with a light touch of salt was perfect. 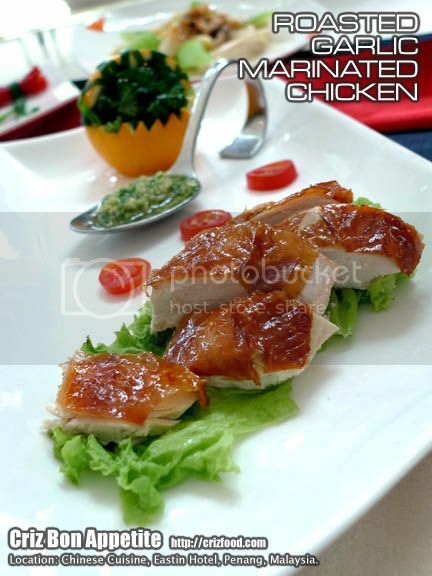 The sauce would also be great with just plain steamed white chicken the Hainanese style. 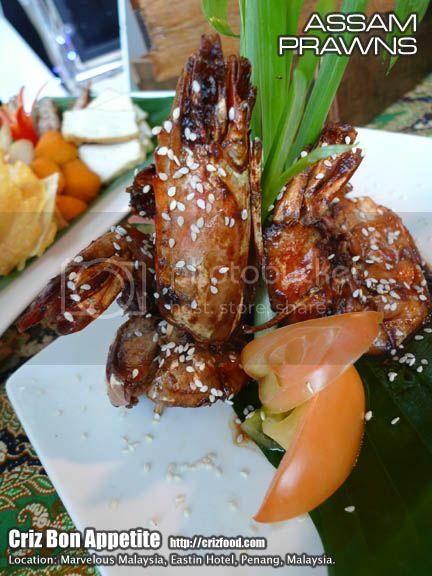 We also had some Wok Fried Butter King Prawns. The dish had some king Tiger prawns stir fried with some chilies, curry leaves in butter and garnish with some egg floss. However, I still think that this dish is more towards Asian fusion than traditional Chinese cuisine. The last of the main course presented was the Sweet and Sour Fish. This was another common Chinese household dish. The dish had batter coated sea bass fillet topped with tomato ketchup based stir fried pineapple, tomatoes, cucumber, onions and red chilies. Simple as it may look but the fillet still had the slight crispiness that I like. Last but not least, we had some Double Boiled Snow Fungus with Pears as dessert. This was another common Chinese household dessert which would be quite beneficial to strengthen the Yin in the body with the current weather which caused many people to be down with flu and cough. 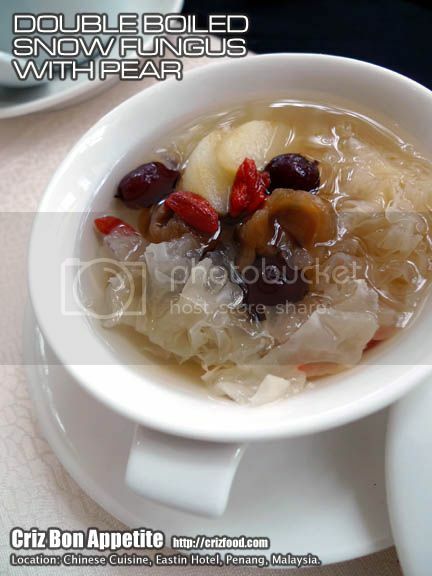 The dessert had snow fungus, Asian pear slices, dried longan, red dates and wolfberries. The only ingredient missing here was the Chinese almonds or commonly known as apricot seeds, which would be great to strengthen the respiratory system. 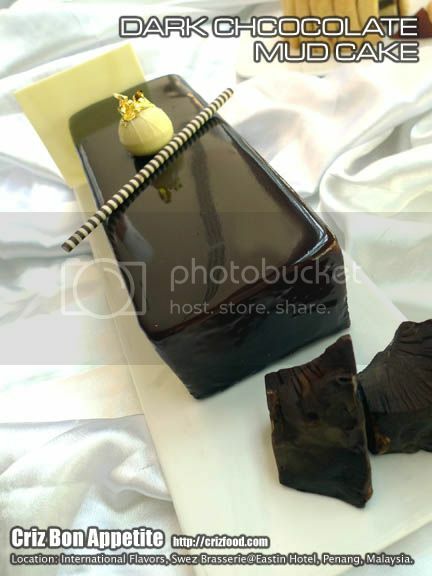 Moreover, the chefs used sugar rather than rock sugar for this dessert, thus having a stronger sugar sweetness. You can also try out my personal recipe for this wonderful dessert. Overall, the spreads served in this promotion were a bit too common in my opinion just like how you would get during any wedding banquet. They lacked the creativity. The dishes have more localized flavors rather than exploring further into the international Chinese cuisine scenes from countries such as China, Taiwan and Hong Kong. There are so many regions in China alone and the chefs could have come out with some of the regional cuisine based on the Eight Cuisines of China such as Hui (Anhui), Yue (Guangdong), Min (Fujian), Xiang (Hunan), Su (Jiangsu), Lu (Shandong), Chuan (Sichuan) and Zhe (Zhejiang). 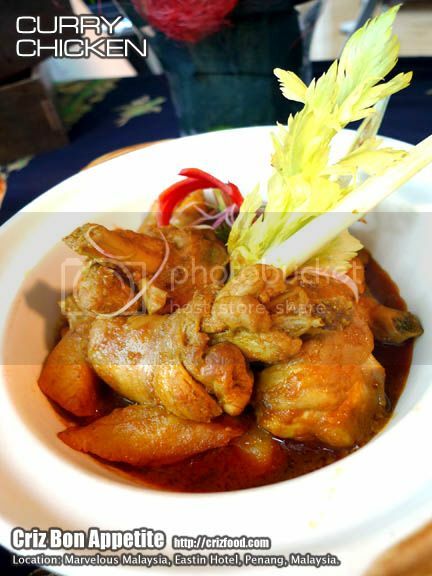 Somehow, the dishes served lack the sourness and spiciness as you would get in certain regional Chinese cuisine. I hope the chefs would look into this matter further to provide more options to the diners. For MAYBANKARD, VISA, CIMB and UOB card members, you can enjoy 15% discount for the Chinese Cuisine Promotion for the whole month of September 2012. 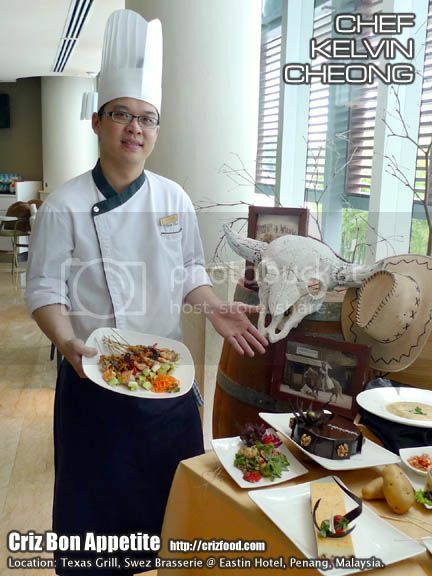 Swez Brasserie @ Eastin Hotel, Penang, would be having its Texas Grill Promotion for the whole month of June 2012 (1-30 June 2012). You can now savor all the mouth-watering dishes as how the cowboys would. 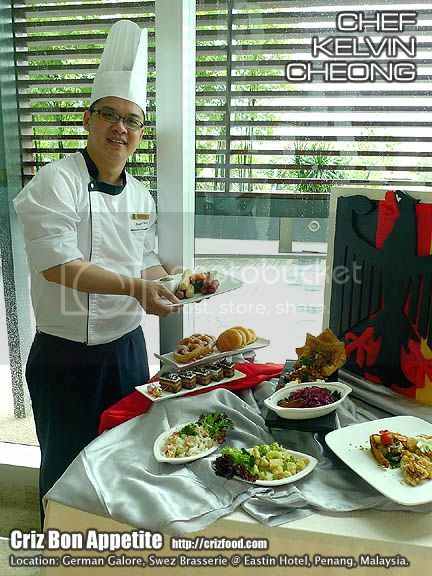 This promotion would be under the skillful hands of the newly appointed Jr. Sous Chef, Chef Kelvin Cheong. We started with the Texas Wild Potato Soup (德式馬鈴薯浓湯). 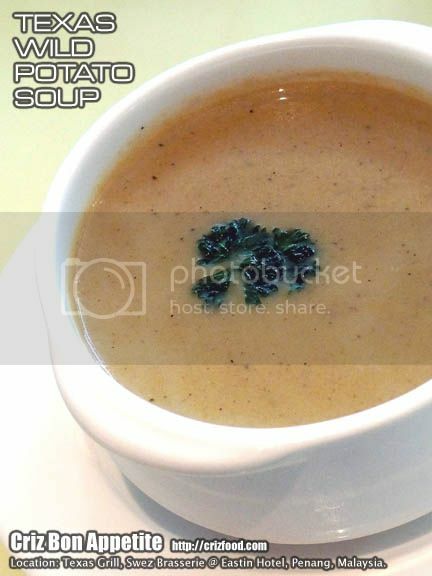 The soup had a slightly burned earthly flavor due to the fact that the USA imported potatoes were marinated with herbs and had gone through the process of baking prior to being blended and mixed in with some flour and cream. It had a brown creamy texture and was quite nice, though a bit salty to my preference. A light touch of fresh herbs added in with a gentle grind of fresh black pepper would have pepped up the taste even better. As appetizer, we were served with Grilled Shrimp and Strawberry Salad (草莓烤蝦沙拉). For non cheese lover, this salad might be quite intruding as it was slightly overpowering. 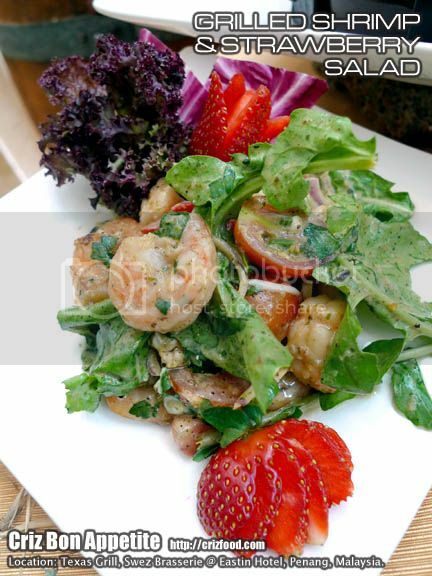 Grilled prawns were tossed together with rocket lettuce, cherry tomatoes, fresh strawberry cuts, fresh herbs, black pepper in a dressing made from a combination of bleu cheese and fruity vinaigrette. The concoction was not bad except that I found the name to be a bit deceiving as there were no distinctive flavors of strawberries. Alternatively, if the cherry tomatoes and strawberry cuts were sun-dried or the strawberries be made into compote and added it, the salad would surely taste better. Another appetizer we tried out was the Texas Broccoli and Turkey Slices Salad (德式火雞片與西蘭花沙拉). I would say, this salad would suit the palate of everyone. 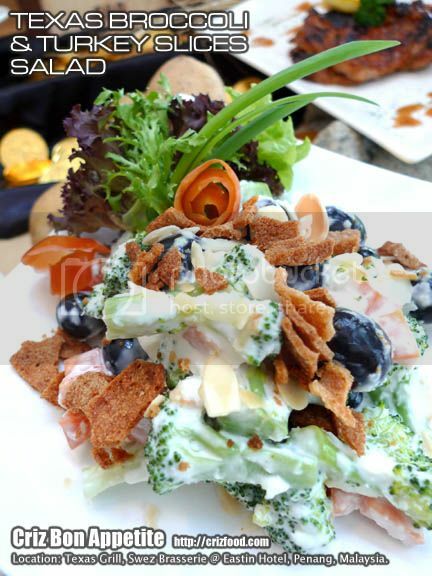 The salad had tossed blanched broccoli, carrot cubes and fresh seedless grapes in a concoction of mayonnaise and desiccated coconut flakes dressing, garnishes with crispy turkey bacon and almond flakes. I was glad that the dressing has just the necessary mild touch of desiccated coconut flakes and was not too overpowering. As for the main course, we had the Texas BBQ Grilled Skewer (德州燒烤串). 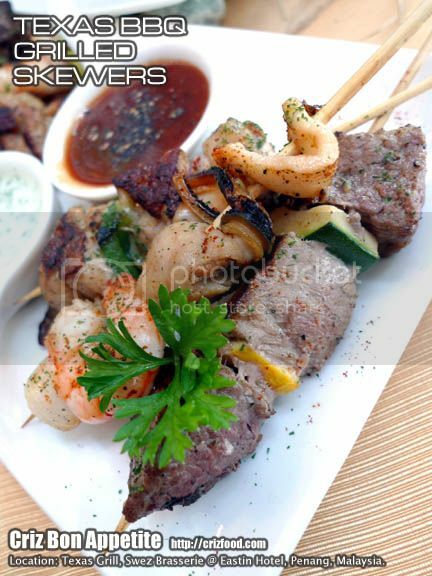 It consisted of 3 different options of grilled chicken, lamb and seafood (shrimp, mussel & squid) skews. All the skews were nicely marinated as they should. The main perfection for grilled skewers actually came from the accompanied dips to boost up the right combination of flavors. 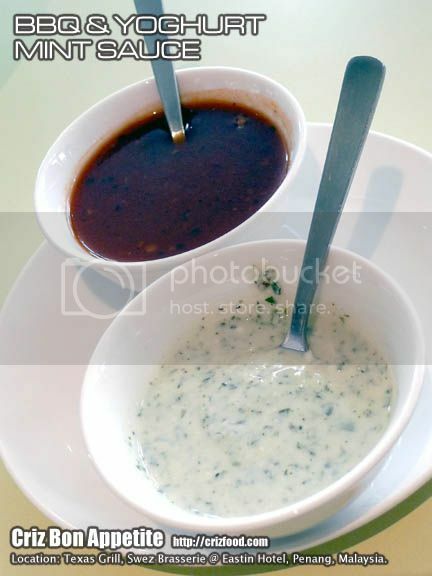 BBQ Sauce and Yoghurt Mint Sauce were provided. Although the BBQ Sauce had the right flavors and smoky taste from some added liquid smoke, it somehow lacked the puree thickness. It might be great as marinate for grilled ribs but it was a bit too diluted as a dip to stick well to the meat. Some chopped onions or tomato puree added in might help solve this issue. It also lacked a light spicy touch of Tabasco sauce. The Yoghurt Mint Sauce on the other hand tasted too “tandoori style” rather than “Texan style” to me. I personally prefer simple mint jelly/sauce to go with my grilled lamb. The Grilled Chicken with Honey Mustard Glaze (蜂蜜芥末醬烤雞) was one of the dishes I can’t get enough of. 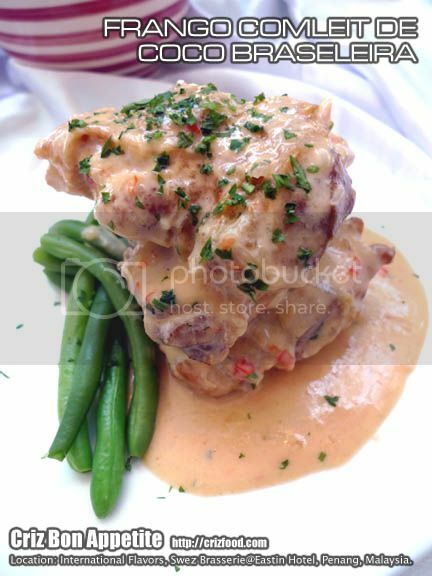 It was wise of the chef to use chicken drumstick fillet as that would be the best part of a chicken to get that tender and juicy texture. Even after some period of time, those choice pieces still maintained the moist within. Well done Chef Kelvin! 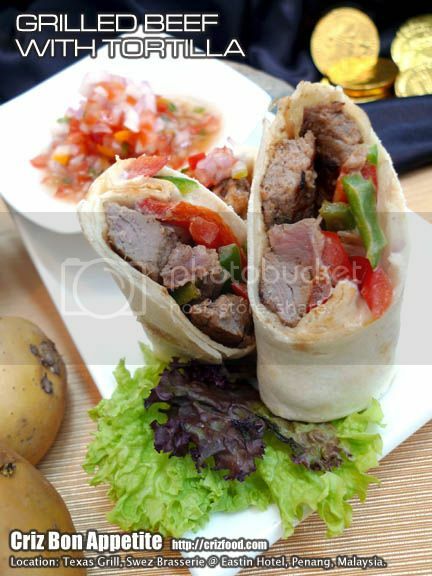 The last dish was the Grilled Beef with Tortilla (烤牛肉片與玉米薄餅). These cut rolls of stuffed grilled beef tortillas were served on a bed of nachos dressed with salsa. My first impression was, “Gosh! They looked so dry!” The first bite had me in amazement. Not only were the roll soft and delicious with tender pieces of grilled beef, it had a light spicy crunch from the added capsicum slices. 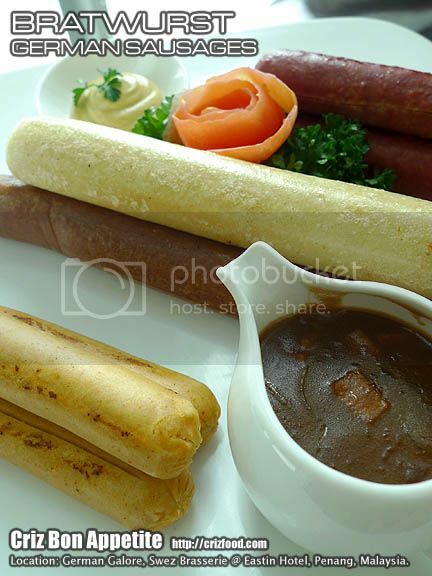 The chef was smart to add into two secret ingredients to moisten the roll – caramelized onions and garlic mayonnaise. Way to go Chef! More salsa was provided for dressing up the stuffed grilled beef tortilla rolls. I won’t mind if some sour cream was to be provided too to dip in the nachos. The desserts were just simple as how you would get from the buffet line. It was too American in general. It lacked the Texan feel and taste. 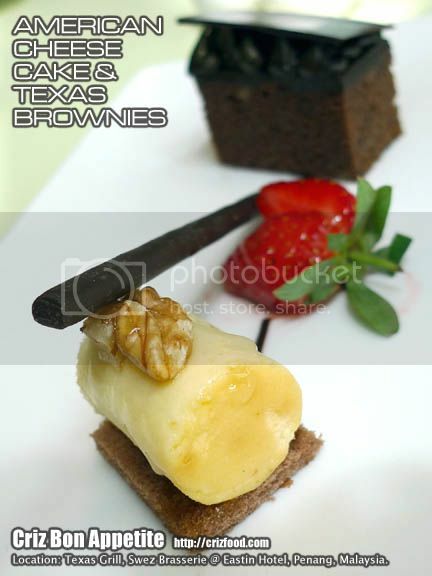 We had the American Cheese Cake (美式乳酪蛋糕) and Texas Brownies (德州巧克力布朗尼). Overall, Swez Brasserie fairs rather well in their Texas Grill Promotion. After all, you can’t go wrong with grills if the cooking time were monitored carefully. Too bad they are concentrating more on grills rather than adding in more fried and Texas State Fair items which are also in the recommended top dishes in Texas. Their Texas Grill Promotion was more towards the Wild West Country Theme where the flavors were wild and suspense. I was rather surprise that they did not promote the #1 Texas State Food which is the Texas Chili. A bowl of the famed thick, hot and steamy chili con carne would add in more excitements in the dishes served, may it be tacos, tortillas, cornbread and more. Corn dogs are common in Texas and they are something that would attract just any age group who loves to have deep fried corn battered hotdogs. As for dessert, I hope they do come out with more options such as the delicious Pecan Pie as it’s the state tree of Texas, as I found the desserts served were too American in general. 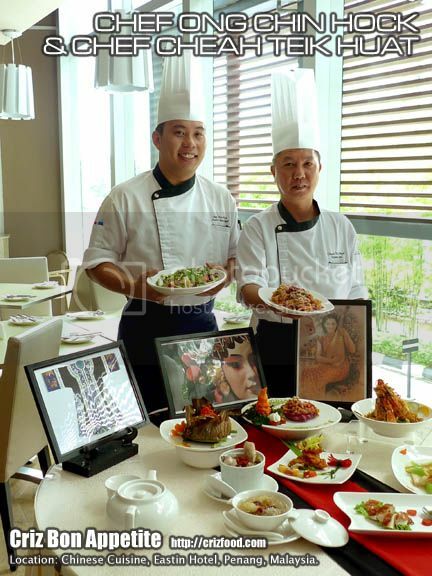 In conjunction with the Thailand’s Songkran Festival, Swez Brasserie @ Eastin Hotel, Penang, would be promoting mouth watering Thai cuisine named Tantalizing Thai for the whole month of April 2012 (1-30 April 2012). The Songkran Festival 2012 would be over 3 days from Friday, 13 April 2012 to Sunday, 15 April 2012. Mahasongkran on 13 April 2012 would mark the end of the old year. Wan Nao (14 April 2012) is the day after and 15 April 2012 is Wan Thaloeng Sok, the start of the Thai’s lunar calendar aka New Year Day. The Songkran Festival is also known as the Water Festival where locals as well as tourists would splash strangers on the streets with water, all in the spirit of good fun. 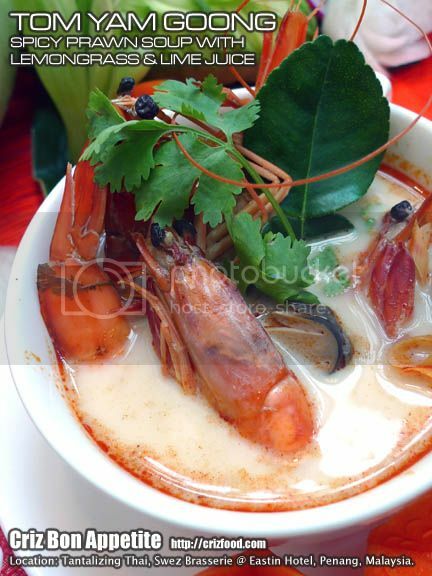 Thailand’s Spicy Prawn Soup with Lemongrass & Lime Juice (Tom Yam Goong/ต้มยำกุ้ง/泰式酸辣鮮蝦東炎湯) would be one dish that you should not miss out in any Thai cuisine due to the unique unity of tastes from the 4S – spicy, sour, sweet and salty. If not, the dish won’t be ranked #8 in the Top 50 Most Delicious Food in CNNGO recently. With the teaming of flavors from the lemongrass, galangal, kaffir lime leaves, shallots, garlic, chilies, fish sauce and lime juice, it was a bowl of heavenly dish. 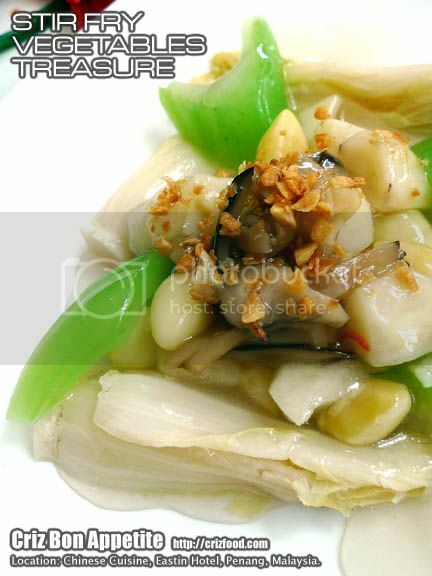 The dish had straw mushrooms instead of the usual abalone mushrooms. The flavor was rather mild for a spicy lover like me but it would be subtle enough for general consumers. I would love to have the dish with a mild touch of nam prik pow (น้ำพริกเผา/Thai chili paste) added in plus some natural fresh taste from some cilantro and fresh tomatoes. This dish had some evaporated milk added in for that extra creaminess. The prawns used were from a harder shelled species. I still prefer mine with white shelled prawns. 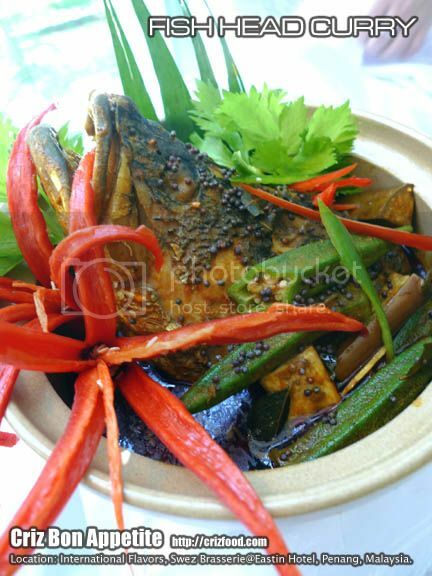 Thai style steamed fish would also be another dish not to miss out as it has all the nice flavors from the freshly used ingredients. 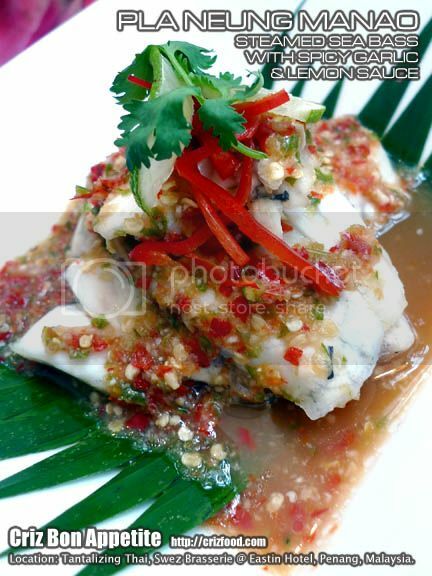 We had the Steamed Sea Bass with Spicy Garlic & Lemon Sauce (Pla Kapong Neung Manao/ปลากะพงนึ่งมะนาว/泰式酸辣蒸石甲魚). 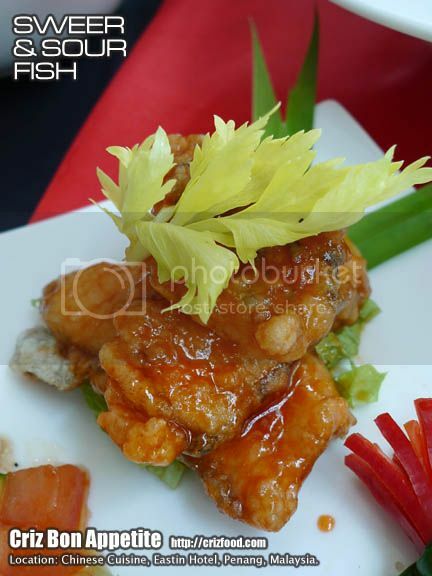 The dish had cilantro roots flavor boosted sea bass fillet topped with a spicy, sweet and sour dressing. The dressing basically consisted of chopped garlic, red chilies, Serrano pepper fiery like local chili paddy with a mild sprinkle of sugar and lemon juice. Great Thai style duck dishes would be quite limited outside of Thailand but Swez Brasserie managed to come out with one flavorful duck dish such as the BBQ Roasted Duck in Red Curry (Gaeng Phed Ped Yang/แกงเผ็ดเป็ดย่าง/紅咖喱燒烤鴨). 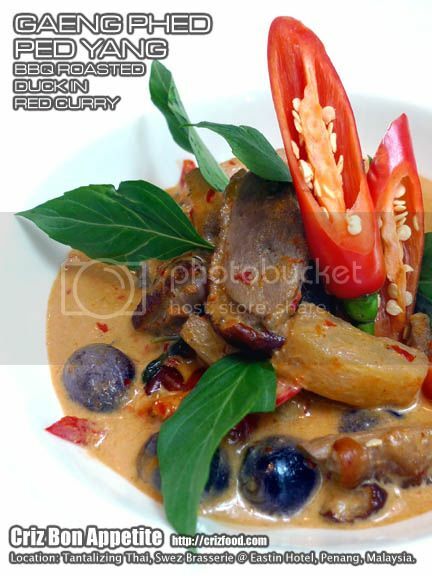 This curry had a sweet, creamy and salty taste from double coconut cream, red chili paste, sugar and fish sauce, enhanced with flavors from Thai basil, Thai apple eggplant, pineapple, cherry tomatoes and seedless grapes. This was an awesome dish as the roasted duck slices had all the flavors soaked within the meat. Although it was a nice dish to go with hot steaming rice, I found the creaminess to be a bit too thick to my personal liking. 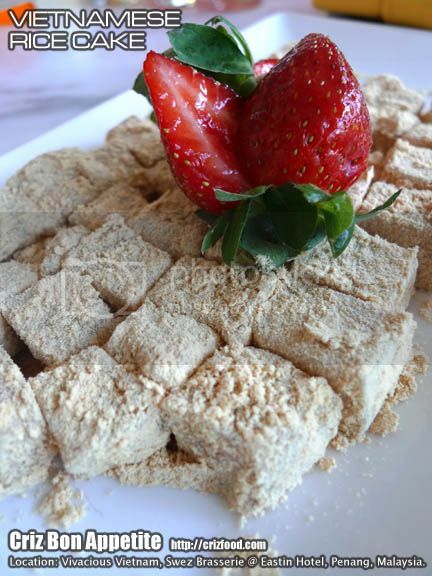 Moreover, the sweetness was not close at all to the sweetness from the usage of some natural palm sugar. There would always be some Thai street food served during the promotion. 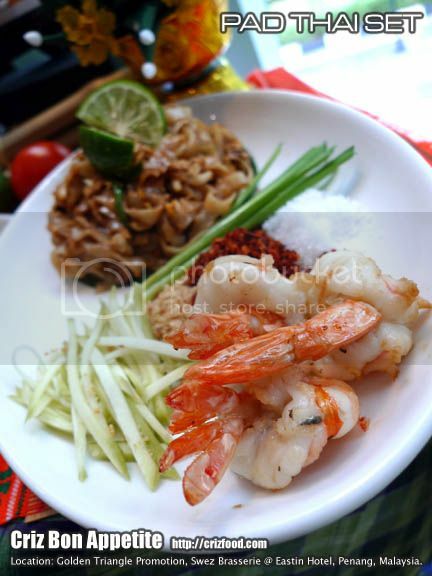 One such dish would be the Thai Style Fried Noodles with Prawns (Pad Thai Goong/ผัดไทยกุ้ง/泰式鮮蝦炒粿條). The noodles were Thai made flat rice noodles, soaked to soften to get the right al dente. The noodles were fried with some garlic, shallots, unsalted turnip, dried shrimps, deep fried bean curd, fish sauce, tamarind paste, some sprinkles of sugar and a squeeze of lime juice. These fried noodles would then be wrapped into a thin layer of fried egg and serve with some deep fried prawns. The noodles would be served with some coarsely crushed peanuts, chili flakes, sugar, raw spring onions and raw bean sprouts. You can adjust your level of spiciness and sweetness by adding in the chili flakes and sugar a bit at a time. Thai desserts are something to crave about especially when you need some sweetness to boost up your day. We had the Mango Sticky Rice (Khao Niao Mamuang/ข้าวเหนียวมะม่วง/香芒糯米粒) which had coconut milk steamed glutinous rice, served with sweet golden Thai mangoes and slightly salted coconut cream. It had some deep fried mung beans garnished for that extra crunch. The whole combination was perfect to end a meal. 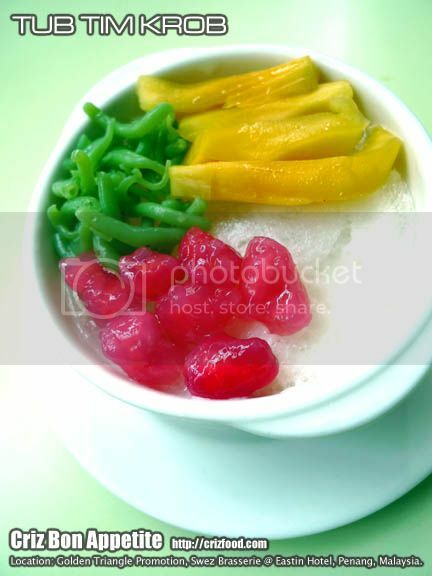 It would be great if the kitchen would add in some screwpines (pandan) flavored steamed glutinous rice too. Overall, the dishes served here were more towards the taste buds of the general consumers. Thai dishes used a lot of fresh ingredients such as fiery hot chilies and fresh herbs to enhance the flavor of its cuisine in which the kitchen did not level up to that extent. It would be good for the general consumption who could not take much spiciness but the dishes were nowhere near to the authentic flavors of the real Thai cuisine such as what I had at my favorite Annathai-Kitchen at Pulau Tikus, Penang. The good news would be that you would be served with lots of fresh seafood. 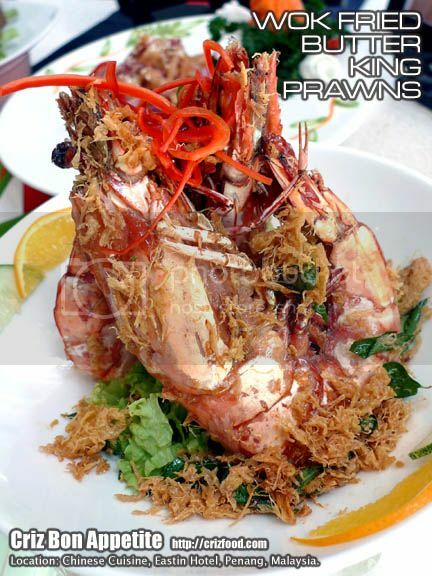 If you are an adventurous diner looking for exotic dishes from other Asian countries, you would realize that Vietnamese restaurants no longer exist in Penang as far as some years back. 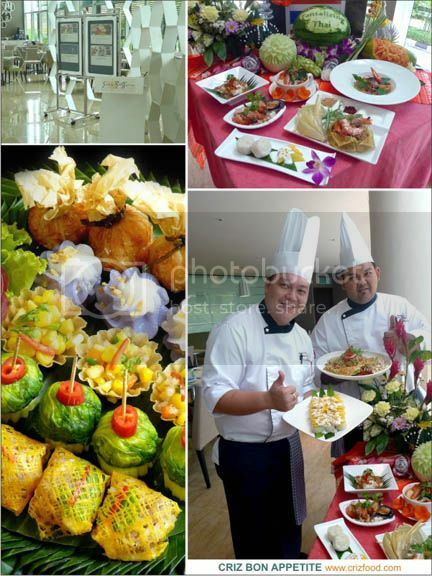 For the month of March 2012, it’s great to have Swez Brasserie @ Eastin Hotel, Penang, to come out with such a promotion named Vivacious Vietnam. 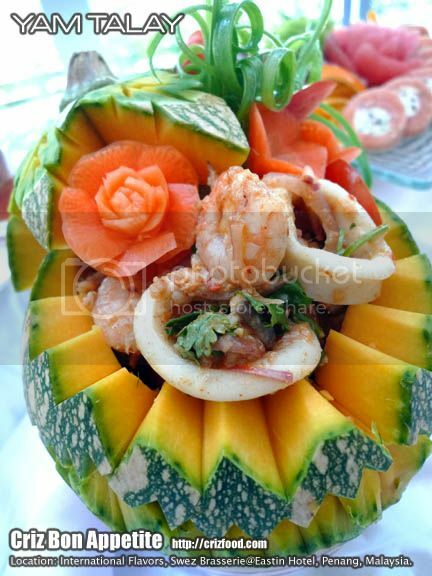 A large number of Vietnamese dishes would be added in their daily buffet spread. Here’s the summary of the promotion. Let’s start from the Soup and Salad Bar Sections. 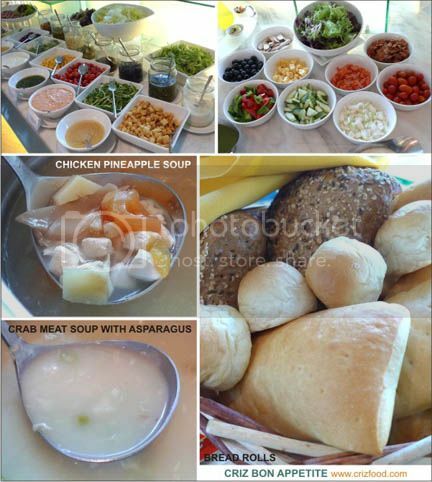 The Soup Section basically consisted of two types of soup such as the Vietnamese Pineapple Chicken Soup which had traces of chicken cubes, bamboo shoots, pineapple and tomatoes. It was mild and nothing special at all as it lacked the strong flavor from the bamboo shoots. At least the second soup which was the Crab Meat Soup with Asparagus had a richer seafood taste that suited me well. There were two “Make Your Own Salad” stations. One station had coral red lettuce, iceberg lettuce, frisee, boiled kidney bean, alfalfa sprouts, corn kernel, cherry tomatoes, pea sprouts, croutons, raisins, pickled olive, pickled onions, pickled zucchini, red pepper in oil, pickled black olive, pickled capers and cheese powder, to be topped with either vinaigrette dressing, French dressing, pesto dressing, thousand island dressing or Italian dressing. The other station had a more meaty selections such as roasted chicken slices, deep fried hams, coral red lettuce, frisee, black olive, cheese cube, carrots, cherry tomatoes, red & green capsicums, cucumber and onions, to be dressed with a citrus tasting green salad dressing and ranch salad dressing. There were also some bread rolls and loaves available with butter and margarine spreads. 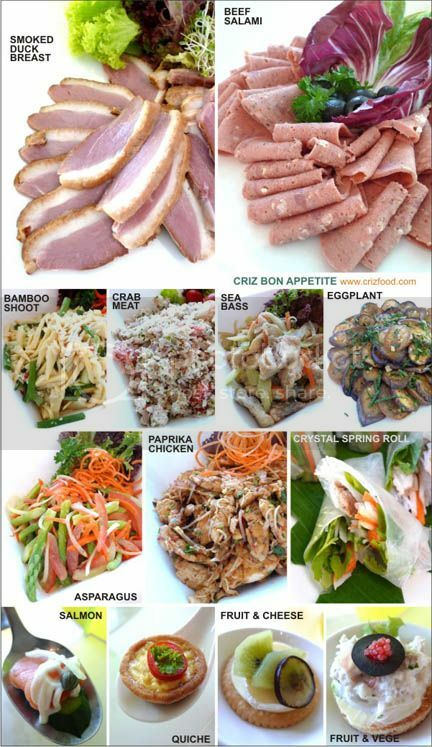 Also at the Salad Bar were two types of Western Cold Platters being served such as the Beef Salami and Smoked Duck Breast cold cuts. 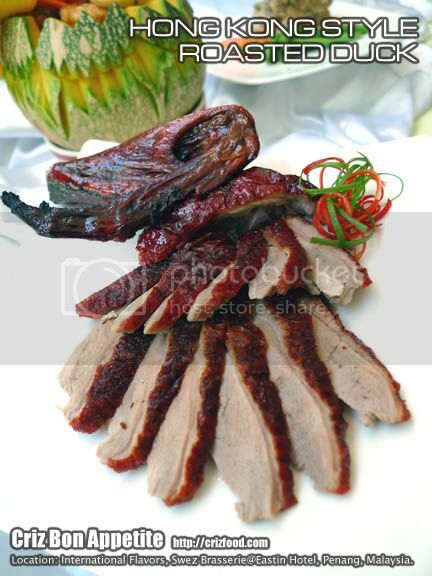 The Smoked Duck Breast excelled better in terms of smoky flavor, taste and cuts. Some ready-made salads were also available such as the Bamboo Shoot Salad, Ground Meat & Crab Meat with Grapefruit Salad, Mixed Celery & Sea Bass Fillet Salad, Grilled Eggplant Salad with Vietnamese Dressing, Asparagus Salad, Grilled Paprika Chicken Salad, Fresh Crystal Spring Rolls with Beef and a selection of canapés. Three items were served at the Action & Noodle Counter. 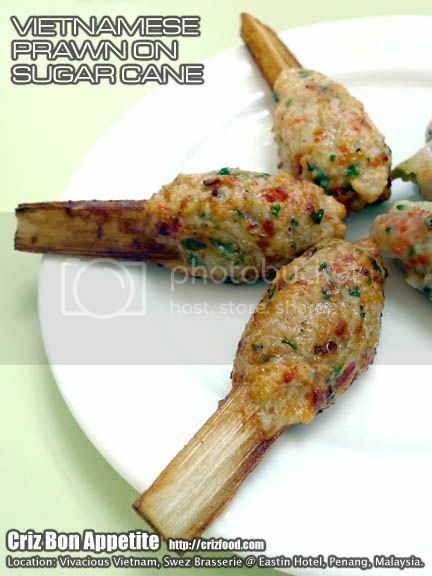 Firstly, it was the Shrimp on Sugar Cane. As for texture and taste, it was quite fine but on a saltier side. Luckily, the condiment of a lightly fresh greens sweet sauce saved the dish from being too disastrous. The Egg Pancake with Prawns was one of my favorite since it was done fresh. 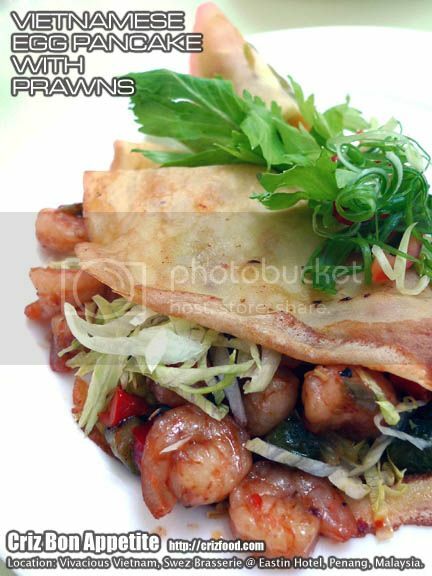 The fragrantly cooked prawns with some capsicum slices cooked in some sweet chili sauce blended in real well with some sliced iceberg lettuce, wrapped in an egg pancake. The Beef Noodles Soup did not suit my taste bud at all. It lacked the sweetness from some marrow or knuckle bones as it tasted more like chicken stock being used instead. 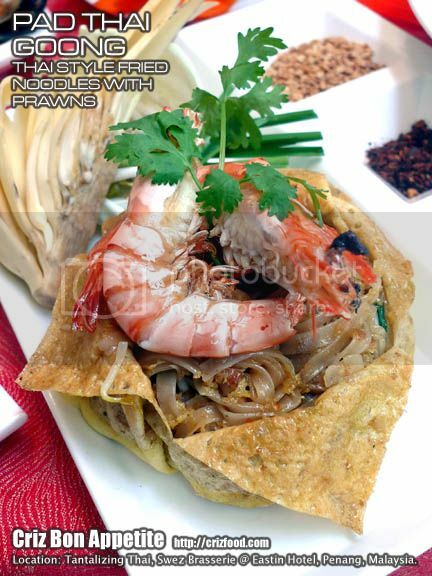 Moreover, local “koay teow” flat noodles were used instead of the Vietnamese bahn pho or Thai chantaboon rice sticks, thus the noodles became too soggy if left alone for a long period of time. On top of the beef slices, fresh bean sprouts, red chili slices, cilantro, spring onions and chili paste being added in, the whole dish lacked the spicy and herb filled punch. I guessed the kitchen has to look more into some additional usage of ginger, clove, cinnamon stick, star anise and fish sauce to push up the flavors for this noodle soup. 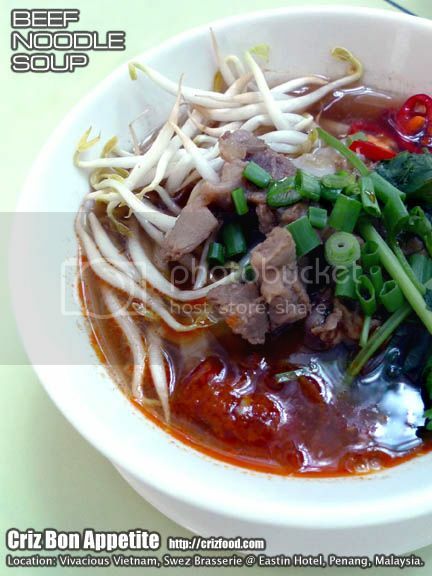 The Hot Dishes Section mainly consisted of a mix and match dishes not only from Vietnam but also from other countries such as Malaysia, Singapore, Indonesia, Germany, France, Italy and India. The spread included Nasi Tomato, Rendang Ayam, Goreng Sayur Campur, Stuffed Crabs, Sauteed Cauliflower with Prawns, Sliced Beef with Lemongrass, Fried Shrimp with Coconut Sauce, Stewed Sea Bass in Claypot, Stir Fried Chicken with Cashew Nuts, Stir Fried Bitter Gourd with Egg, Stir Fried Rice Vermicelli with Assorted Meat, Sauteed Vegetables with Almonds, Roasted Sweet Potatoes, Grilled Lamb Chop, Steamed Rice, Spring Rolls, Vegetarian Fried Rice, Long Bean Sambal and Aloo Gobi. 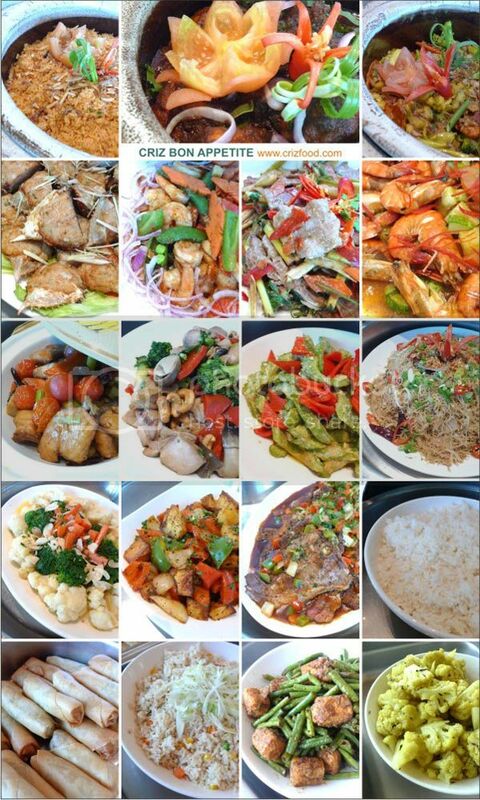 Personally, I quite like some of the dishes from the hot dishes section. The Nasi Tomato was full of fragrance from some of the nicely added spices. The Rendang Chicken cut was rather large and went perfectly well with the tomato rice. 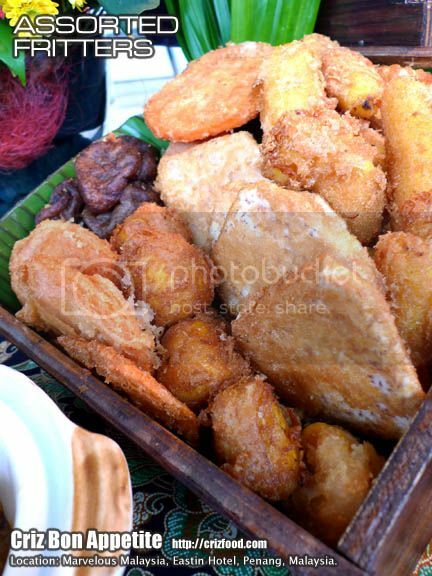 The Goreng Sayur was common just like those served at the Nasi Kandar stalls with added turmeric powder. The Stuffed Crab was just average as the stuffing had the texture of fish balls and tasted just like spiced fish balls without some added crab meat. 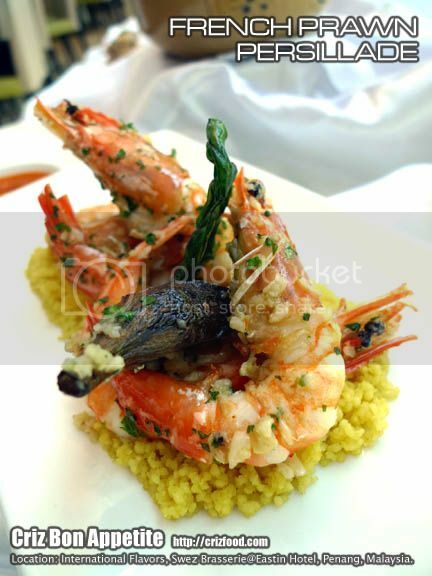 The Sauteed Cauliflower with Prawns was also common. 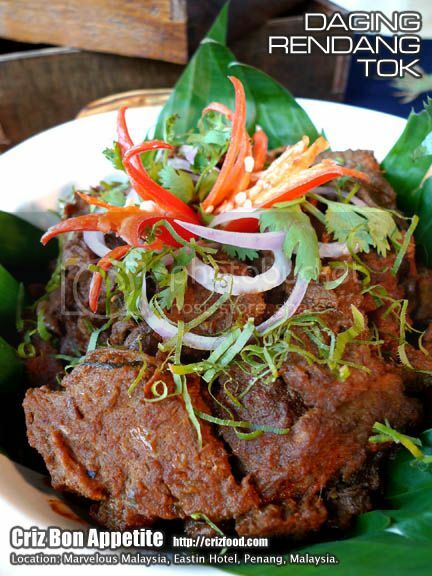 The Sliced Beef with Lemongrass had tender beef slices but lacked the spicy flavors. The Fried Shrimp with Coconut Sauce practically had the taste of frozen prawns without flavors. The back of the prawns should have some slits to allow flavors to seep in the flesh. The Stewed Sea Bass in Claypot tasted quite fine and it had chunks of fresh fish being used. The Stir Fried Chicken with Cashew Nuts was nice. The chicken cuts were juicy and tender. With the nutty flavors from the cashew nuts, the whole combination was perfect. The Stir Fried Bitter Gourd with Egg was simple but it had a nice fragrance from the added chili oil. The Stir Fried Rice Vermicelli with Assorted Meat was just average. The Sauteed Vegetables with Almonds no doubt was a simple dish but the roasted almond flakes sure pepped up the flavors. The Roasted Sweet Potatoes was just another simple stir fried dishes with added capsicums and onions. 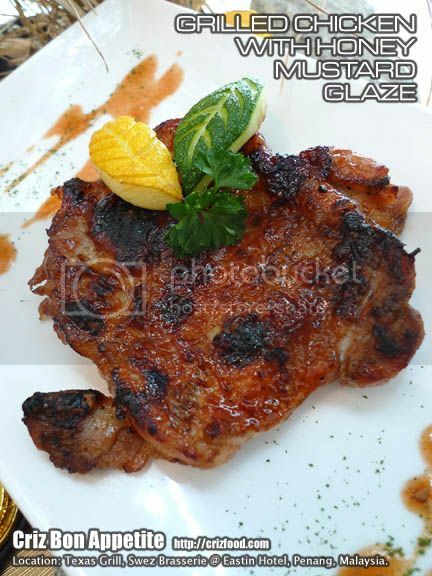 The Grilled Lamb Chop somehow was under marinated and a bit too tough. The chops had a strong lamb taste. Steamed Rice was just steamed rice. The Spring Rolls was normal. The Vegetarian Fried Rice basically was not my type of fried rice dish as it lacked flavors. The Long Bean Sambal which had some added deep fried bean curd was just nice. The Aloo Gobi which had cauliflower stir fried with some turmeric powder and cumin was totally out from the ones I had elsewhere. The dish was rather dry and lacked the taste from more spices and cilantro as garnishing. I saw only gobi (cauliflower) but where were the aloo (potatoes) then? The Dessert Section had 6 flavors of Nestle Ice Cream with different types of toppings, Assorted Fruit Platters, Assorted Cakes and Pastries, Jelly, Pudding, Green Bean Soup, Assorted Local Nyonya Kuih and a few choices of Vietnamese delicacies. Another great dessert was the Glutinous Rice Ball in Gingered Brown Syrup (Che Troi Nouc). 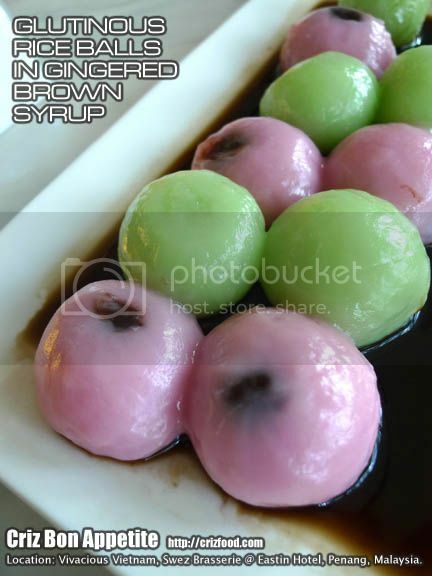 The soft glutinous rice ball with either red bean paste or pandan kaya paste went well with the gingered syrup. There was also the Vietnamese Rice Cake. The filling tasted like out Malaysian ketupat but with green bean powder sprinkled on those small piece of rice cakes. There was nothing special about this dessert as it was not sweetened at all. Another of the dessert that caught my curiosity was the Vietnamese Potato Cake. It looked just like apple pie with sprinkled grounded cinnamon but the taste was not up to my expectation. I was surprised that normal French fries potatoes were used instead of sweet potatoes. Somehow the taste did not blend in real well as a sweet dessert. Overall, the spread served here were more towards international dishes with at least half of the dishes consisted of Vietnamese cuisine. No doubt it was a well balanced mix and match dishes that would suit just anyone but I personally found that the taste and flavors for the Vietnamese dishes were too mild to my liking. The dishes somehow did not have much of the authentic Vietnamese cuisine. The kitchen should have looked into dishes with a much heavier usage of fish sauce, shrimp paste, fermented beans, spices and herbs.